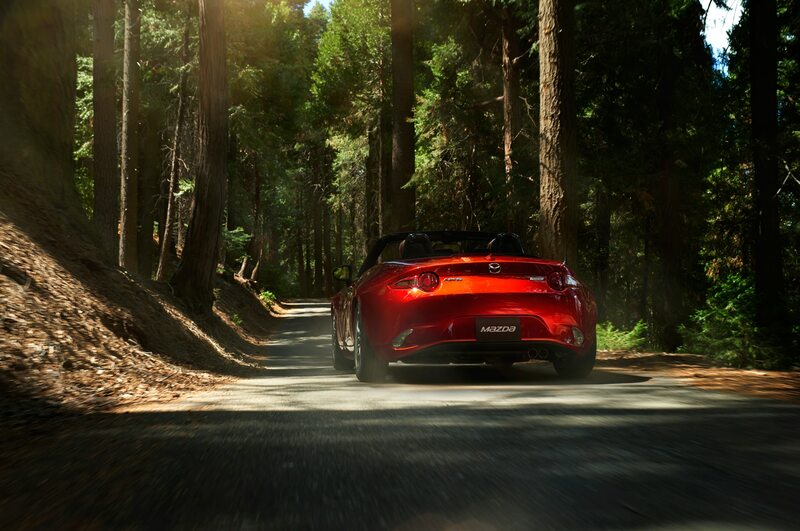 Cutting even more mass from the lithe roadster. 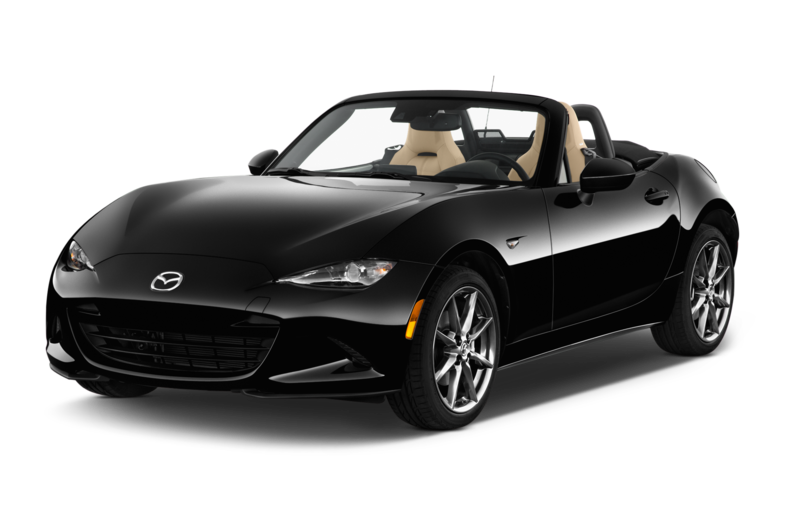 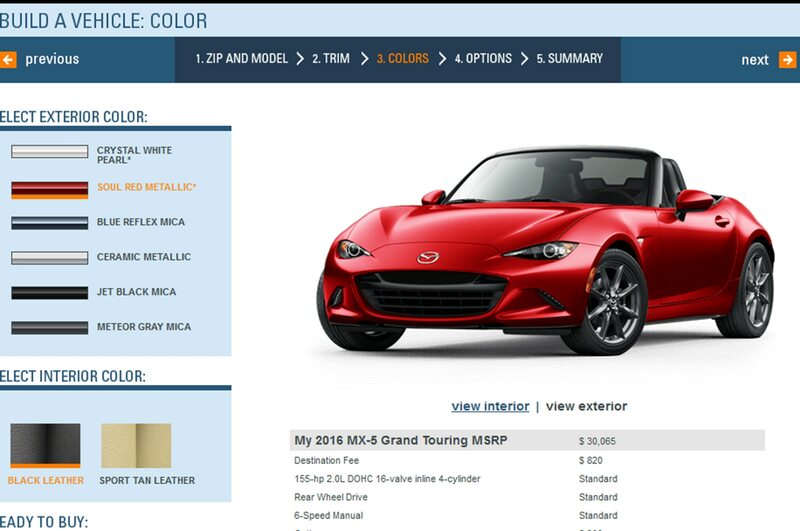 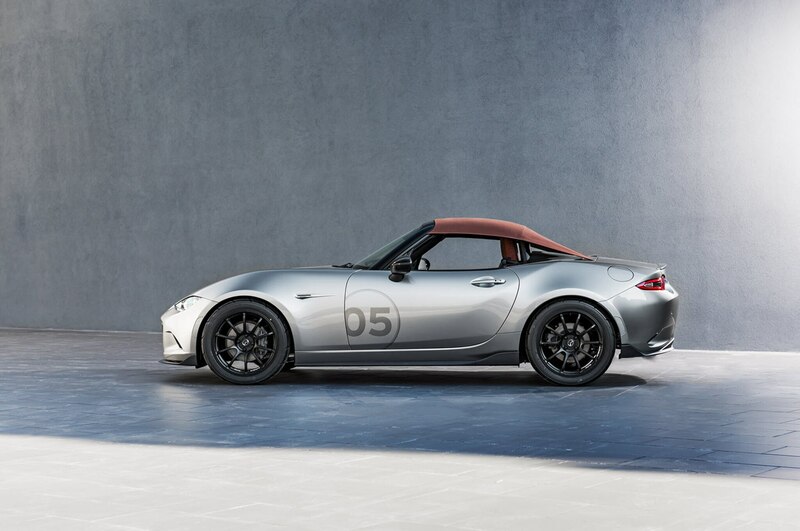 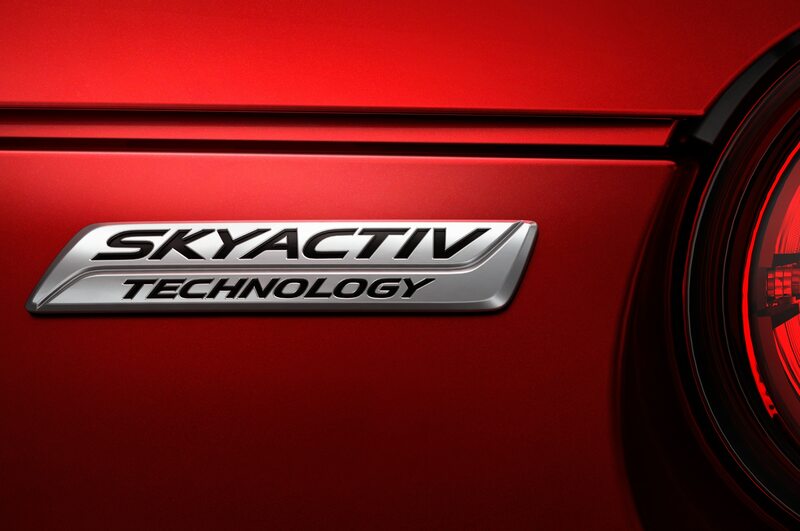 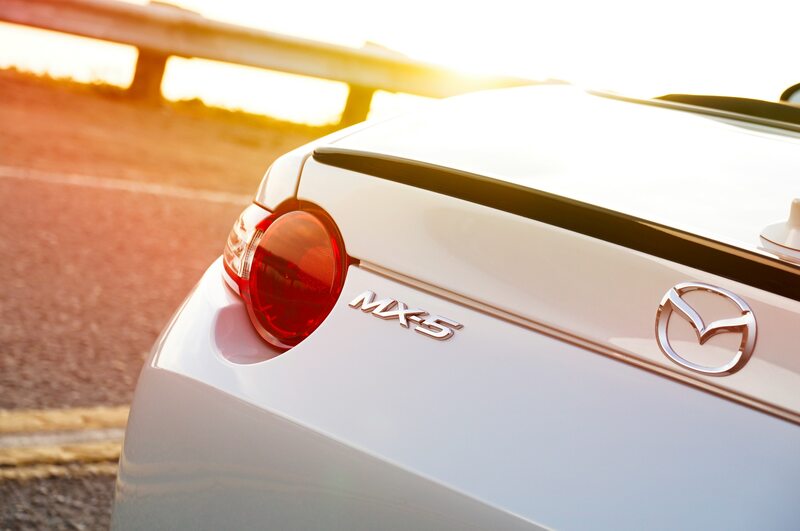 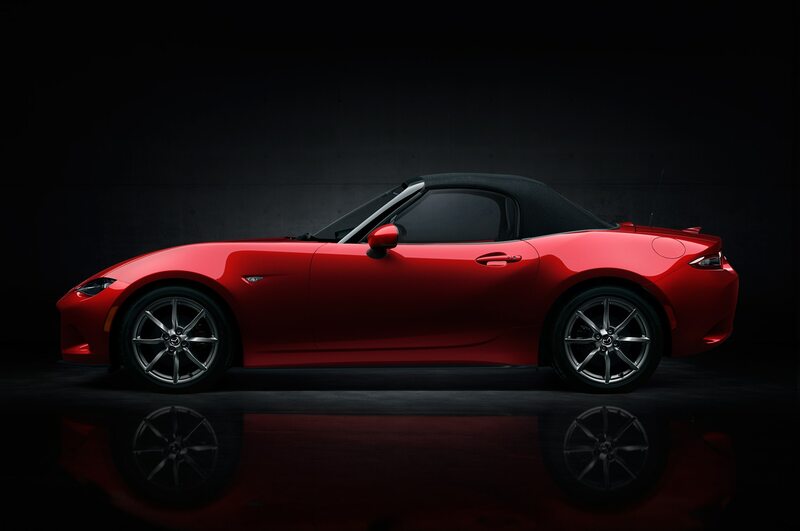 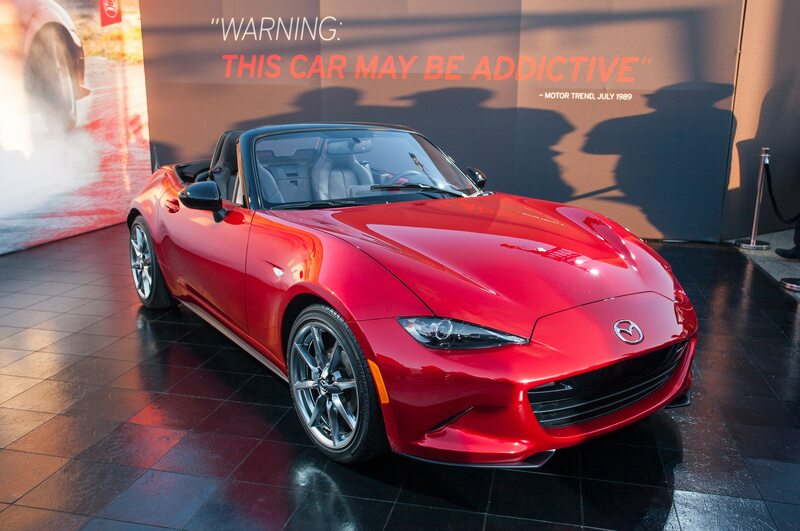 Mazda engineers worked hard to shave as much mass as possible from the new 2016 Mazda MX-5 Miata, but what if that diet regime went to an even greater extreme? 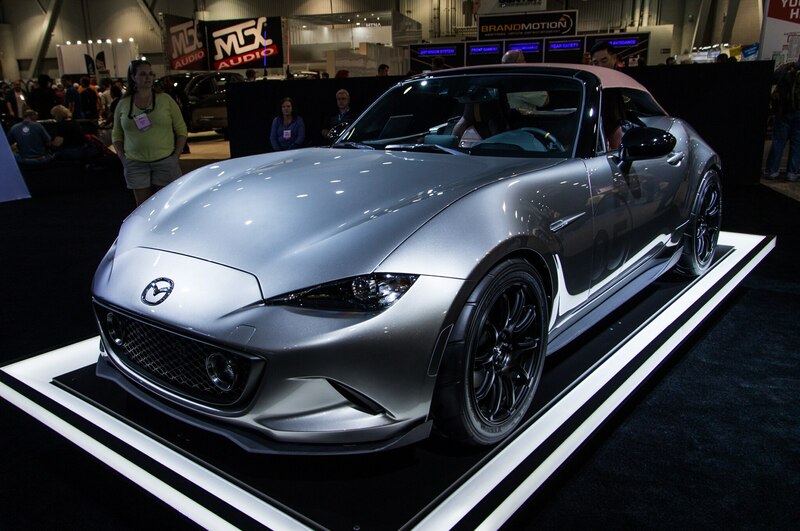 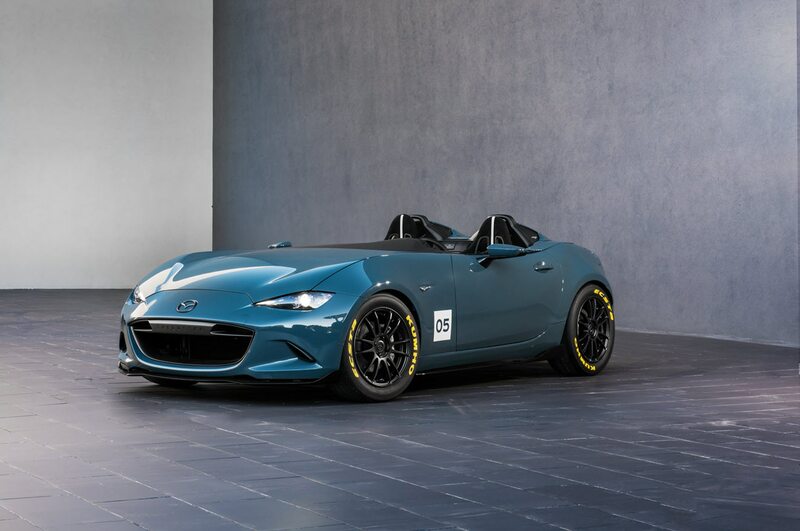 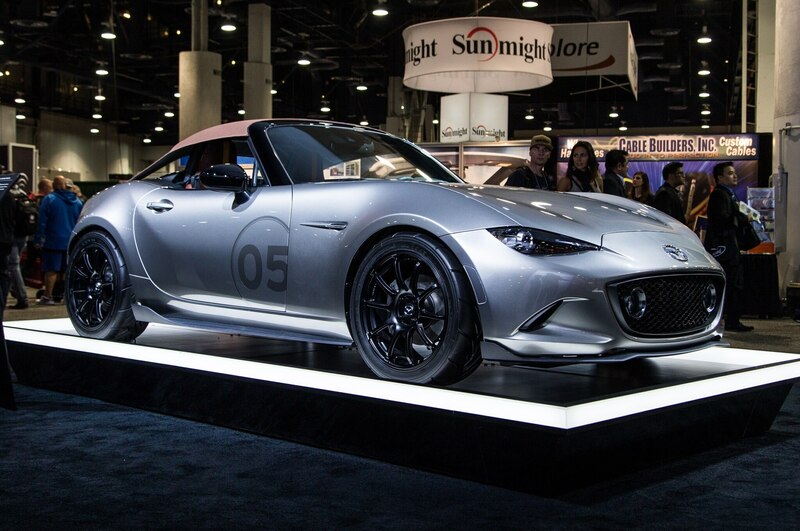 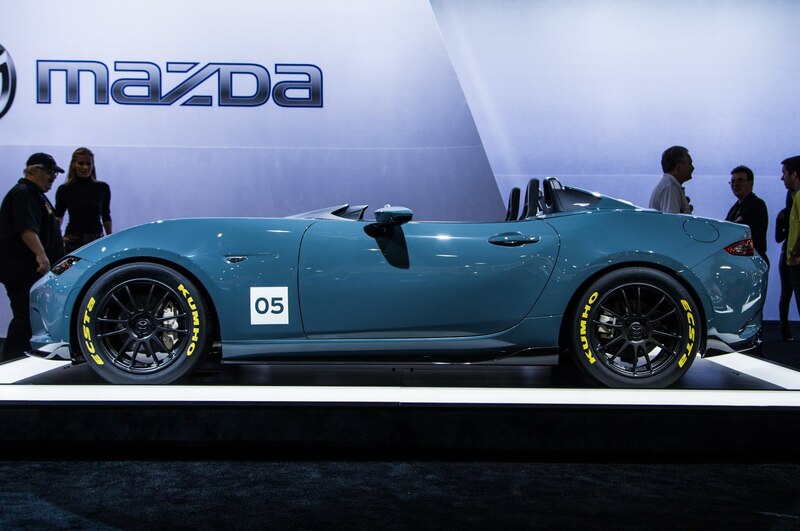 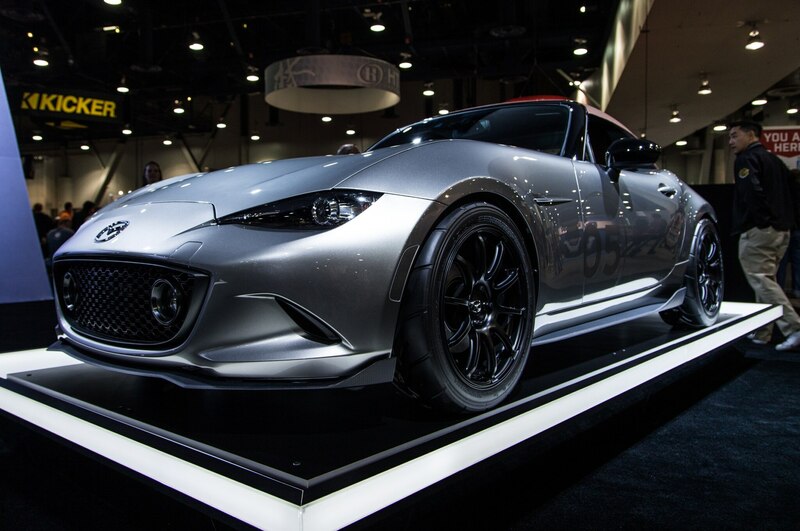 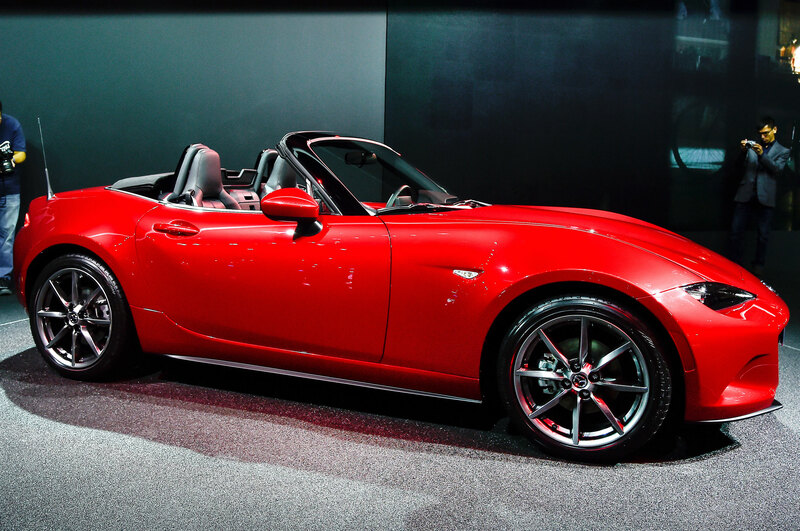 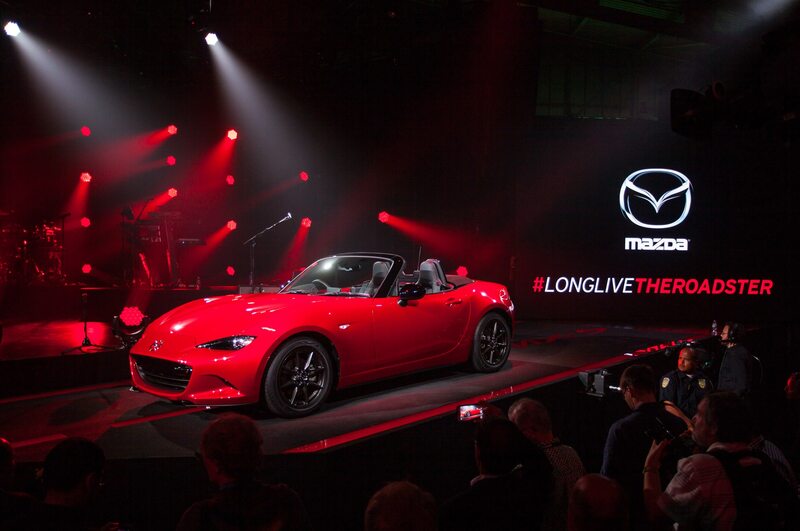 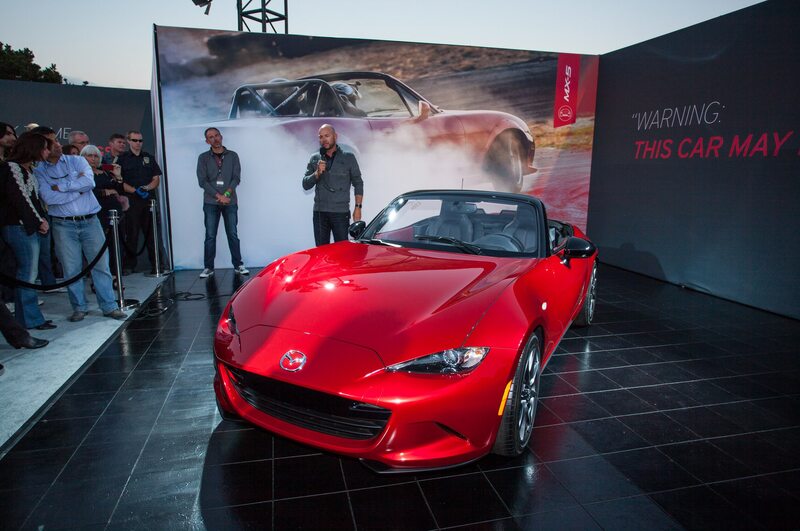 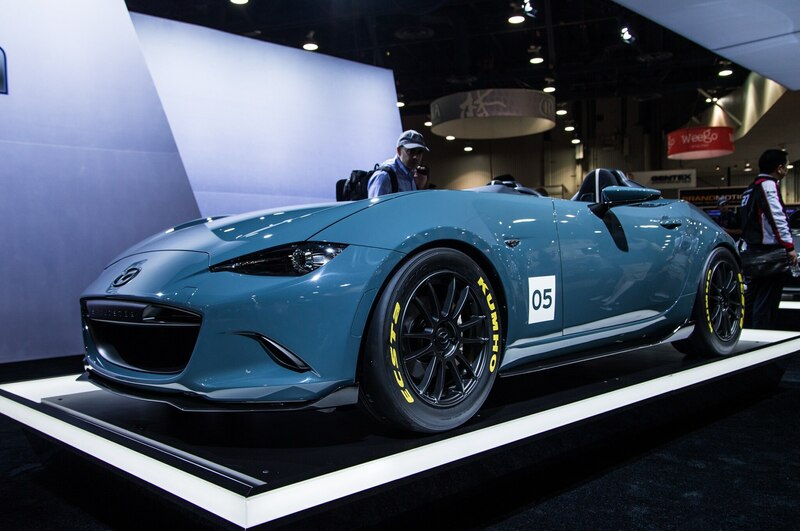 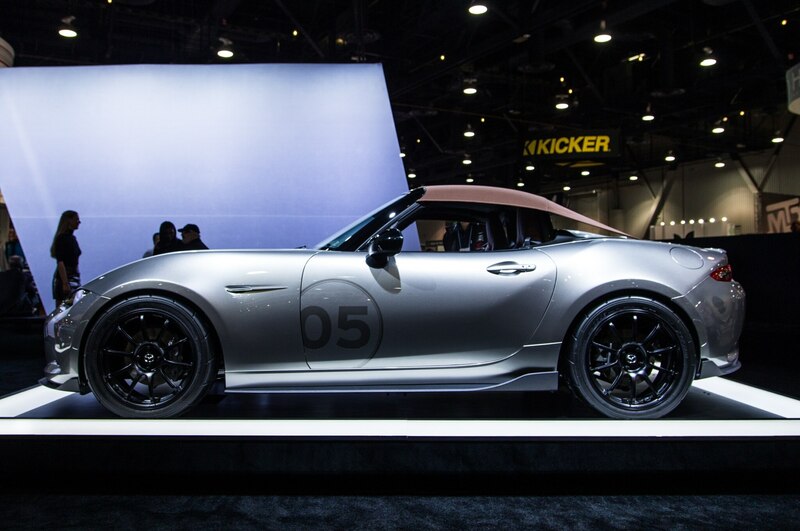 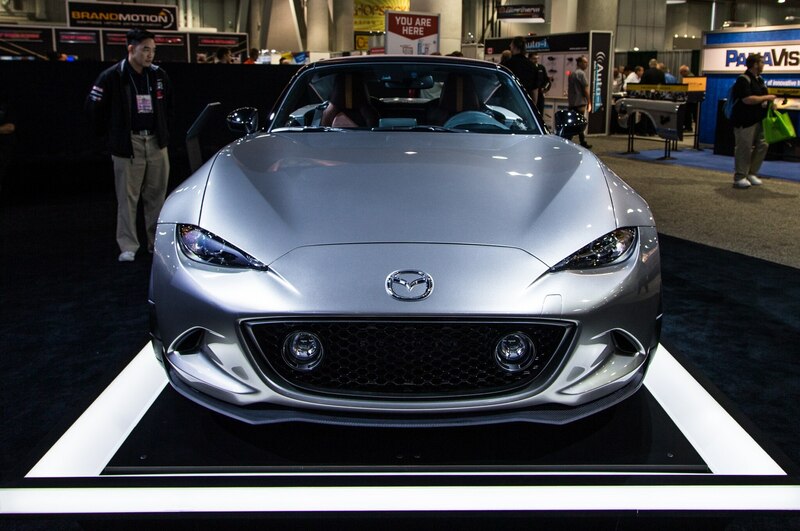 At this week’s SEMA show in Las Vegas, Mazda pulled the wraps off the ultra-skinny MX-5 Spyder and MX-5 Speedster concepts to show just how far the weight-loss strategy can go. 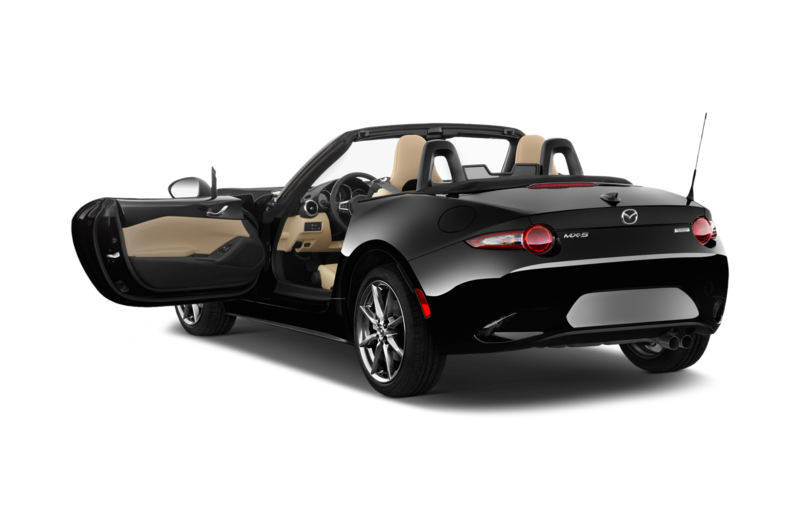 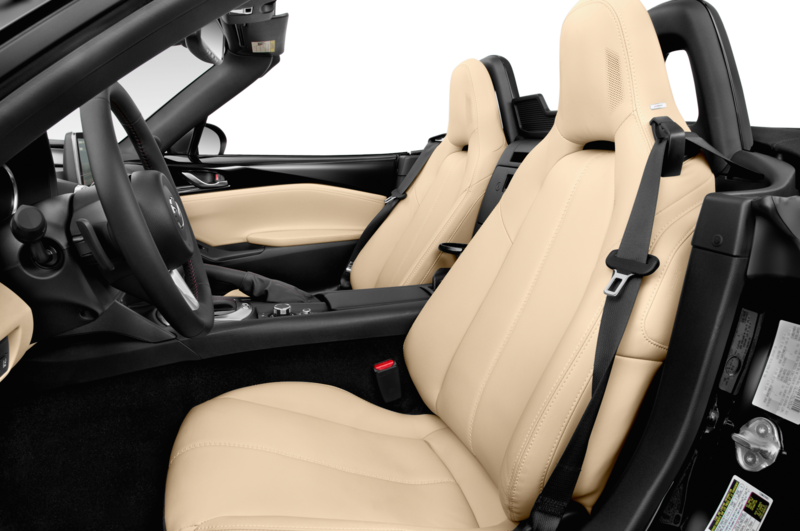 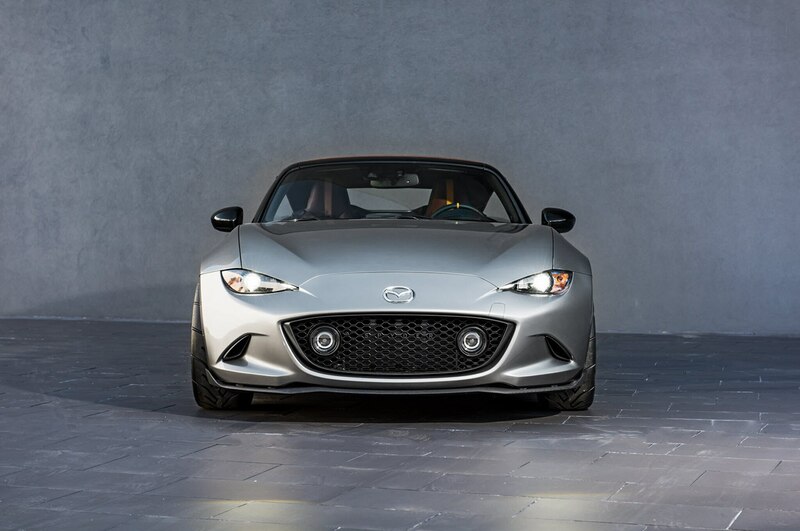 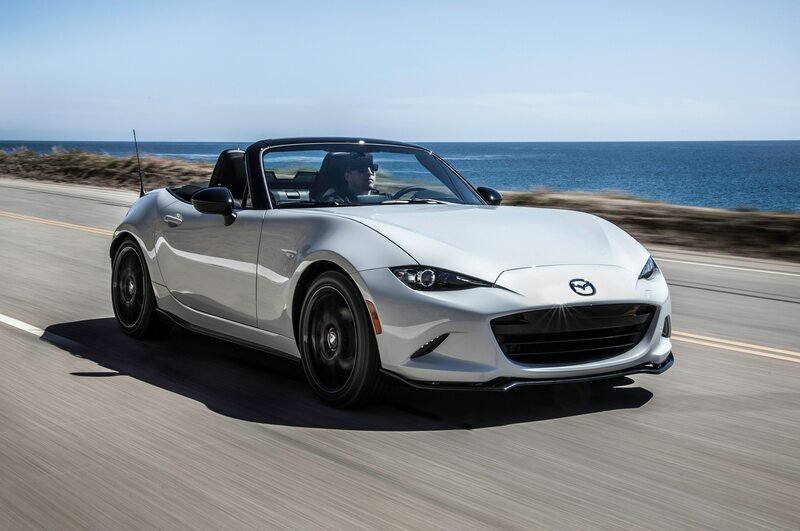 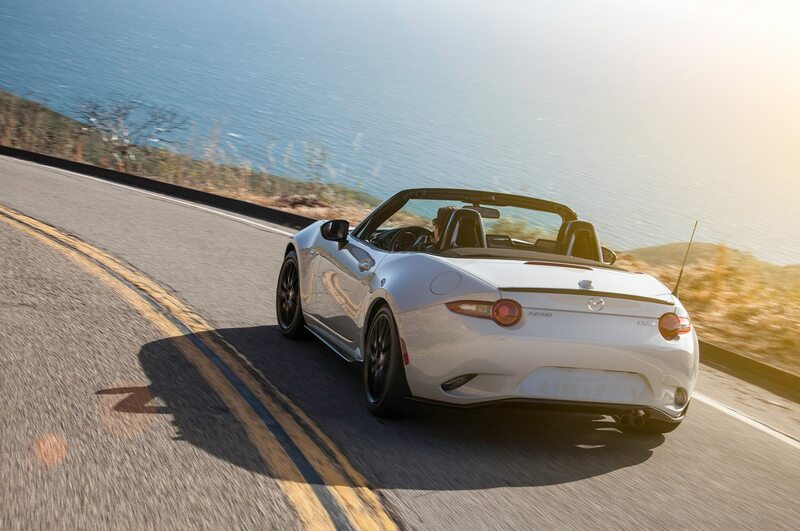 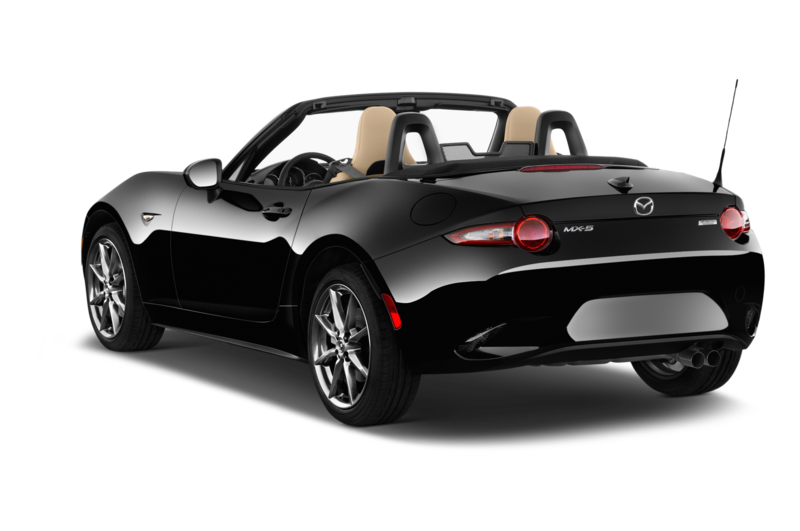 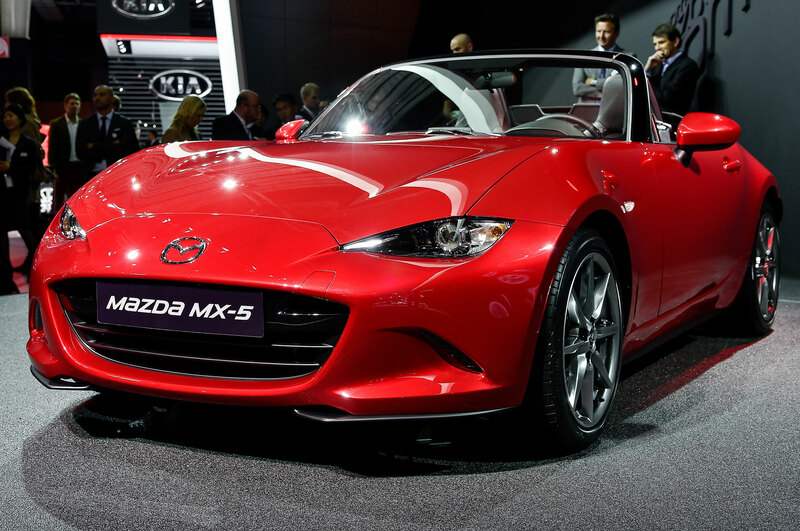 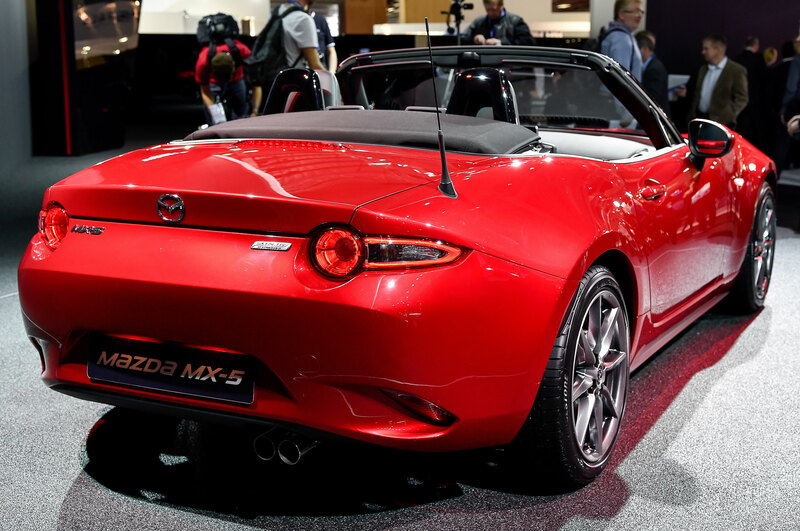 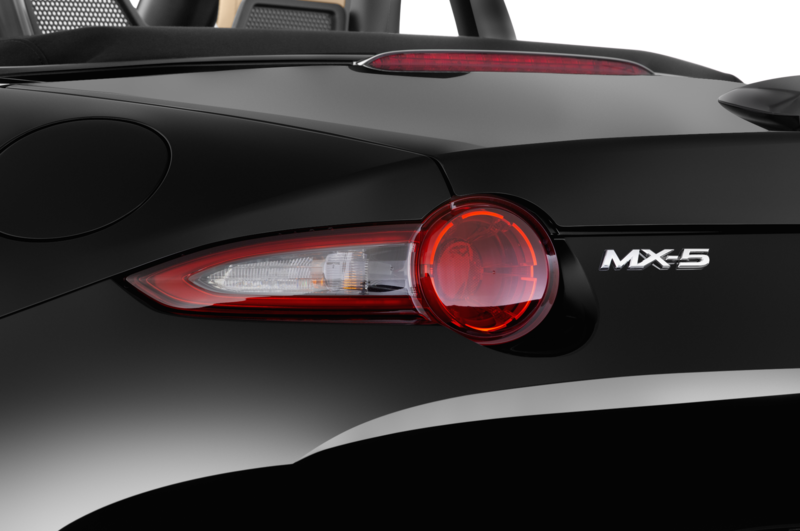 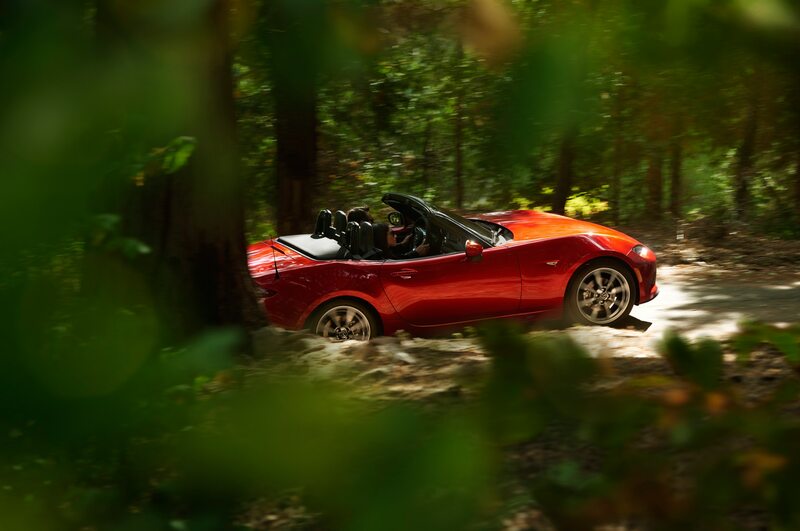 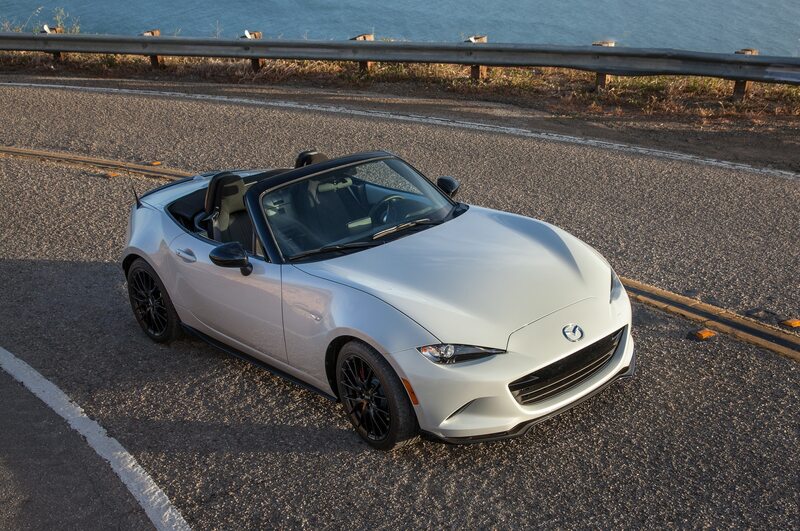 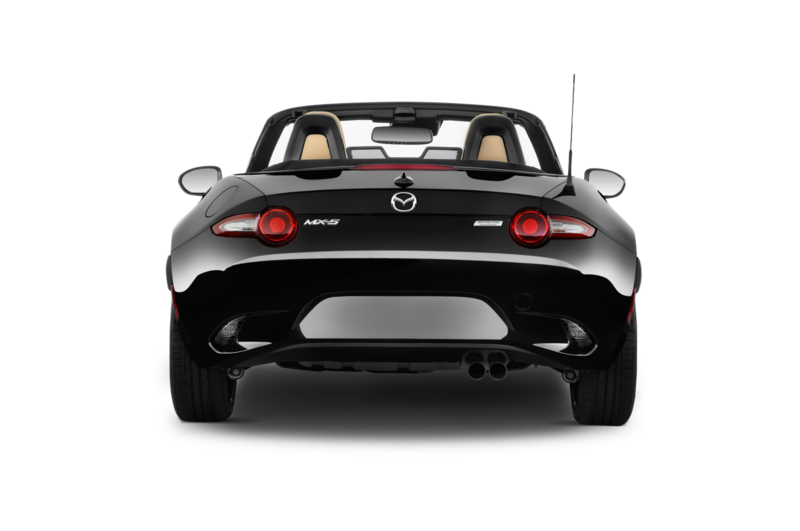 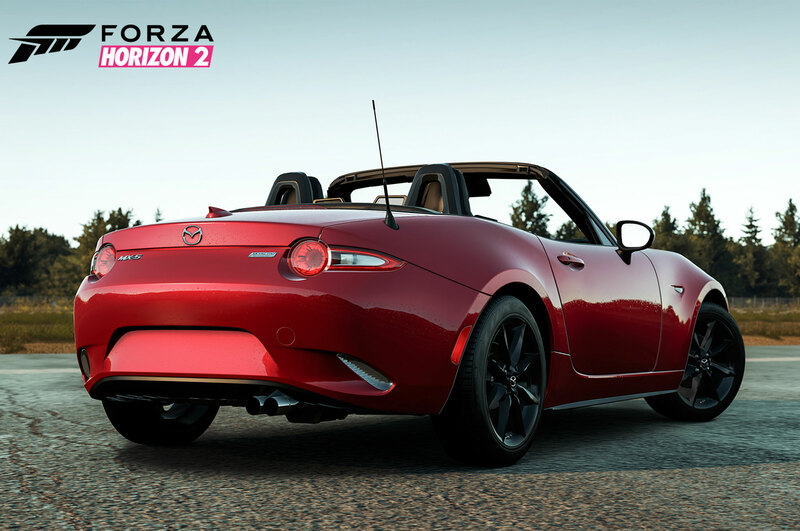 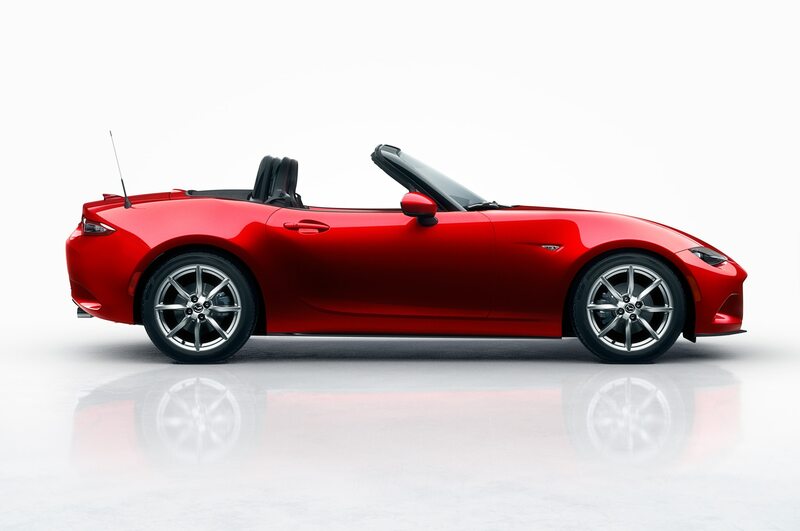 The MX-5 Spyder is the tamer of the two show cars, designed to look like a vintage roadster with a new tan bikini top designed by American Sunroof Corporation. 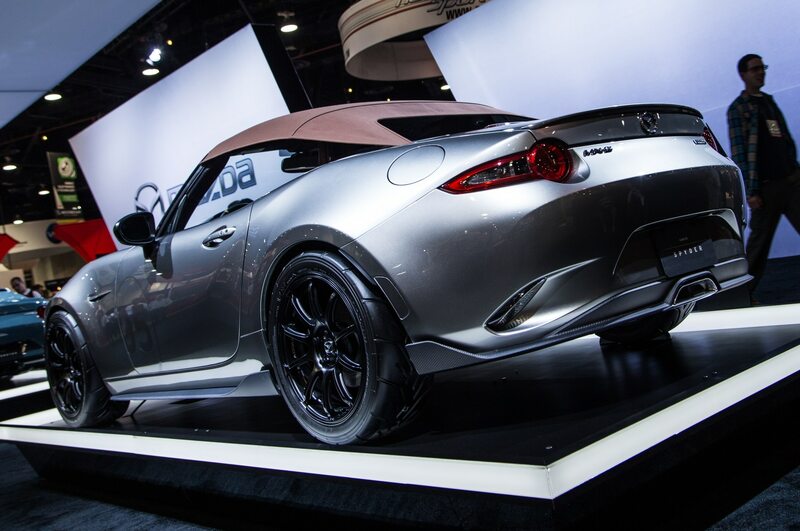 New carbon-fiber aerodynamic parts, a center-exit exhaust, an adjustable coilover suspension, and Yokohama Advan Racing 17-inch wheels are also fitted. 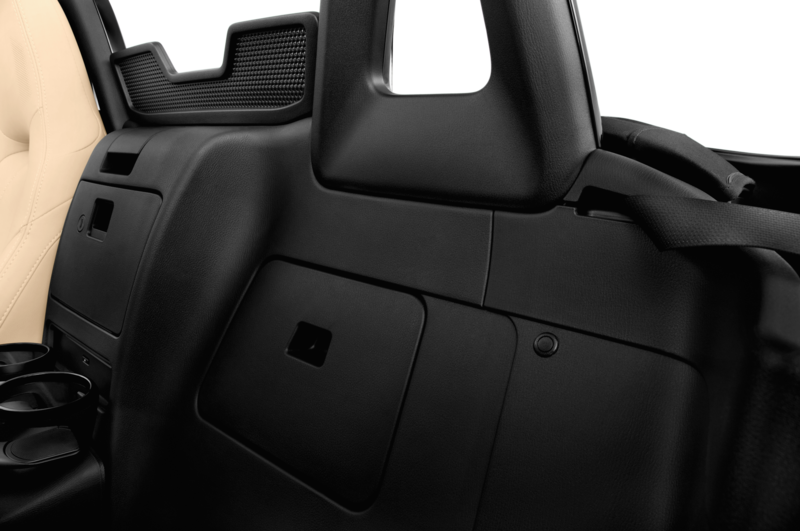 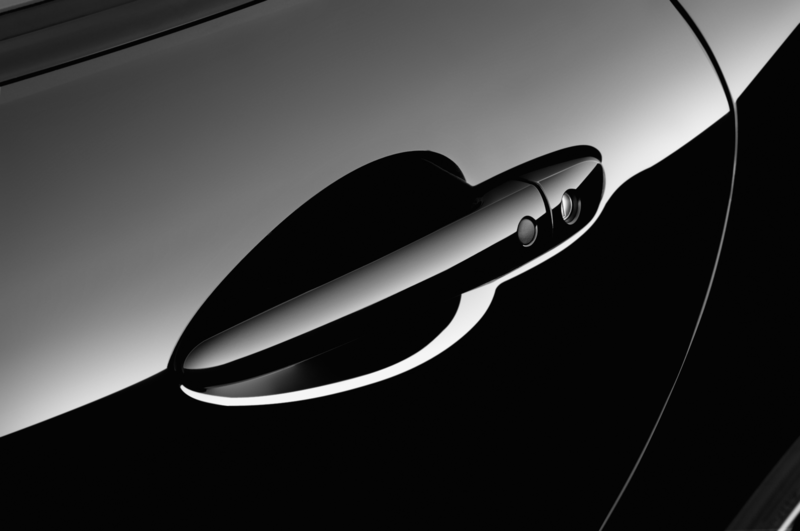 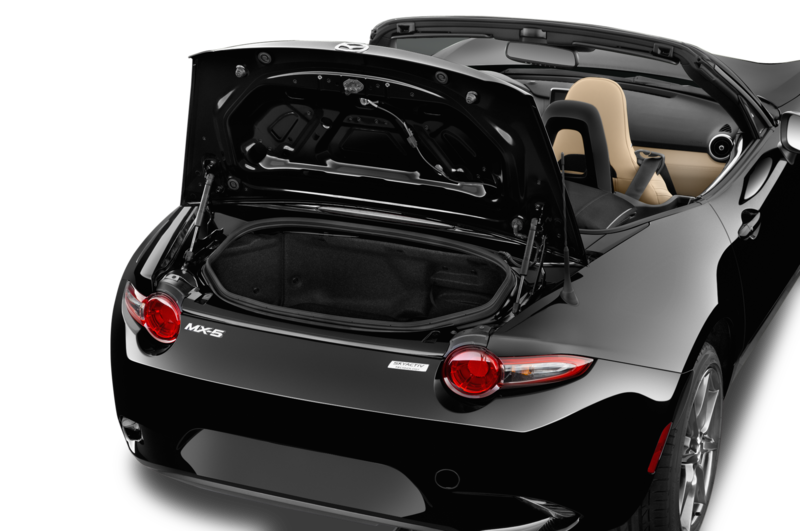 For the full vintage-car treatment, the Spyder also scores new leather upholstery and Mercury Silver paint with a number decal on its doors. 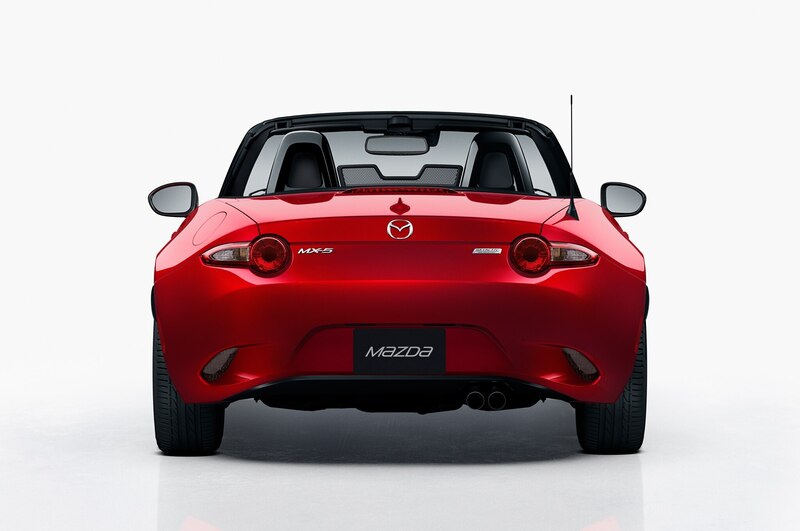 The car’s weight is a claimed 2,301 lb. 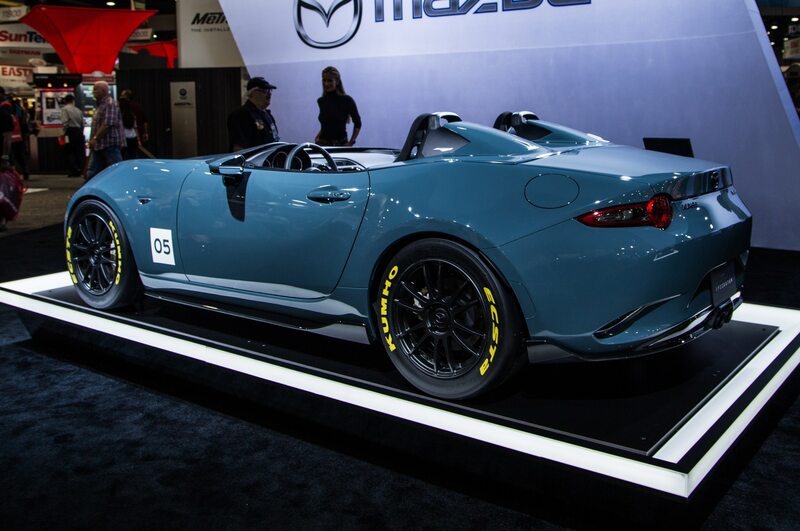 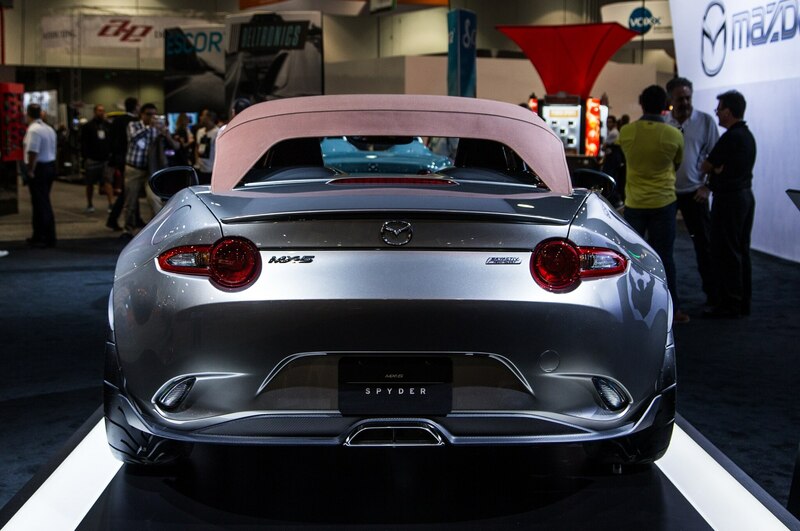 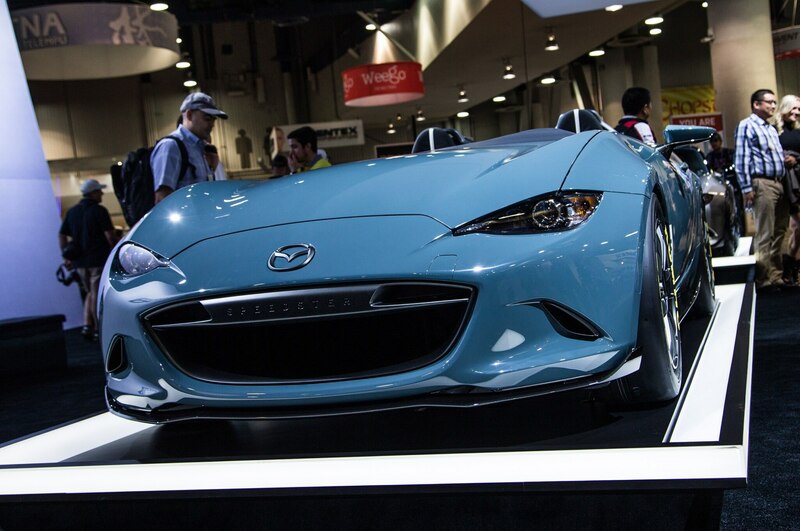 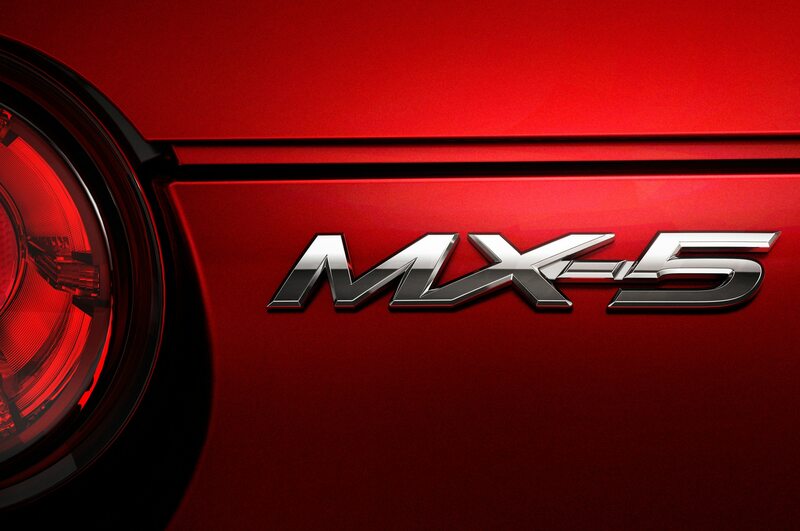 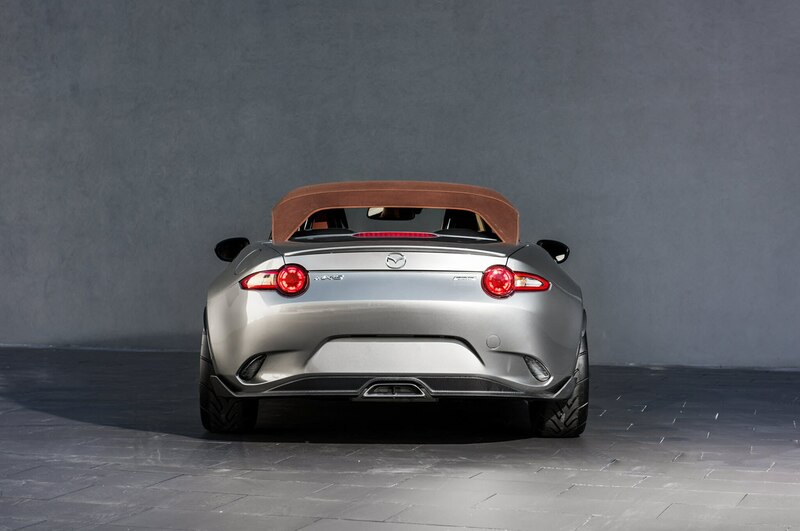 When developing the MX-5 Speedster concept, Mazda engineers went even crazier. 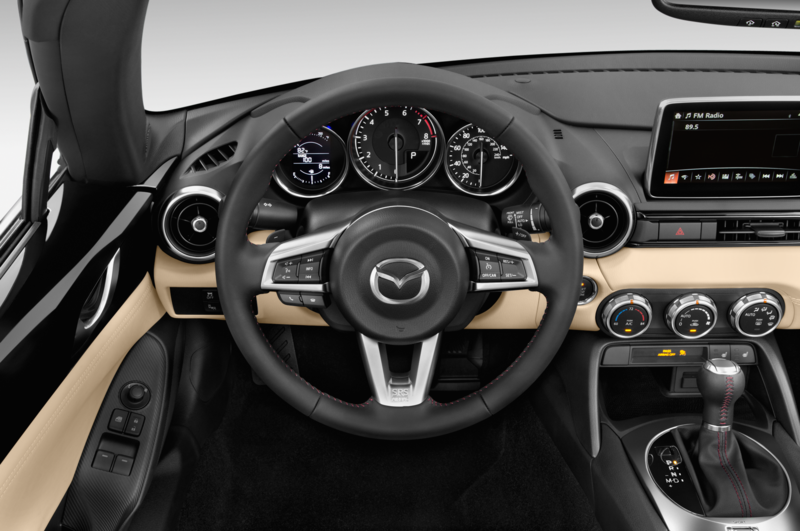 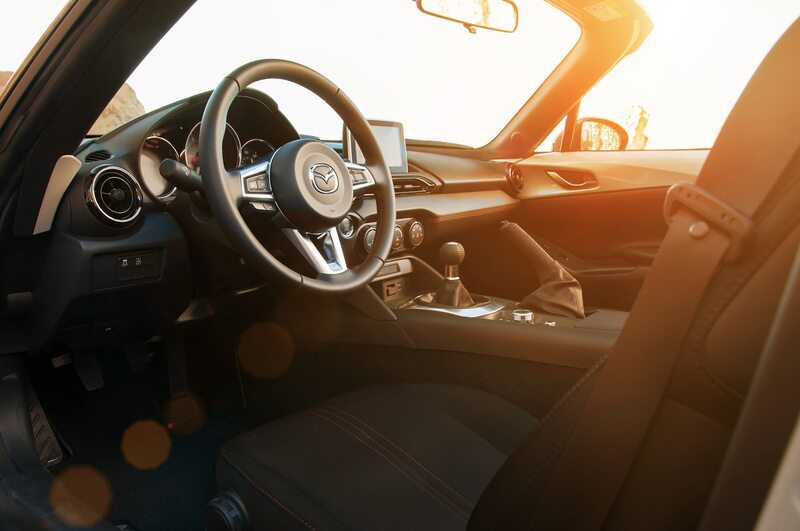 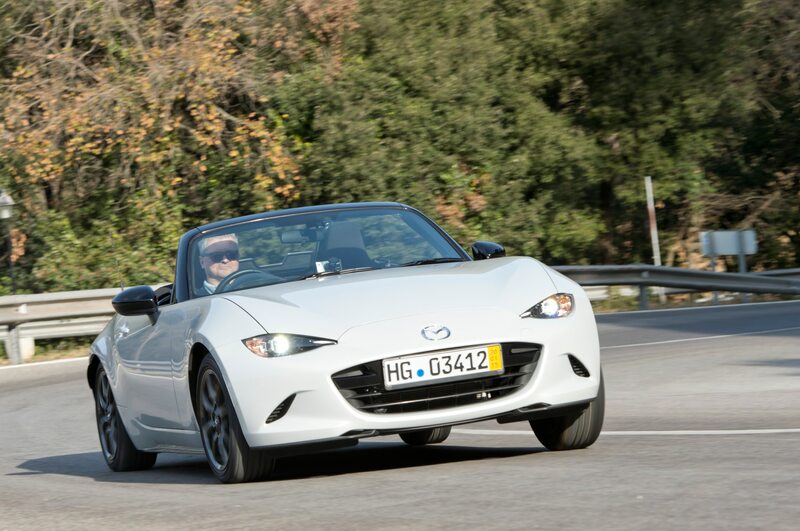 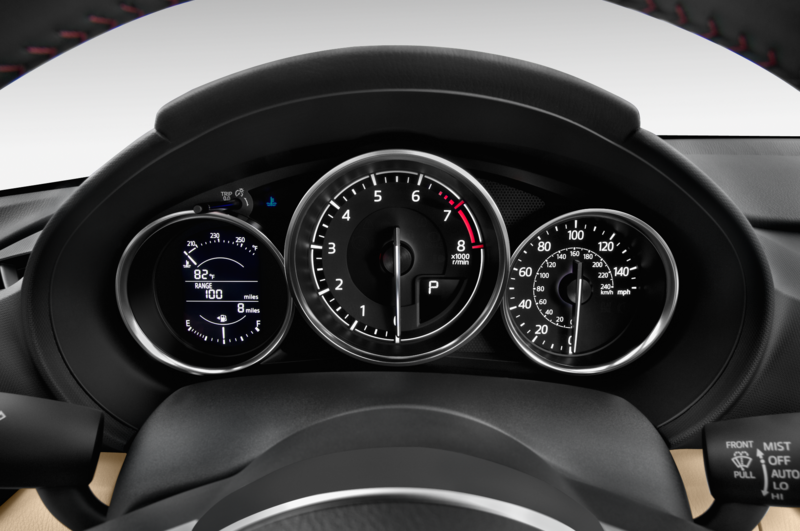 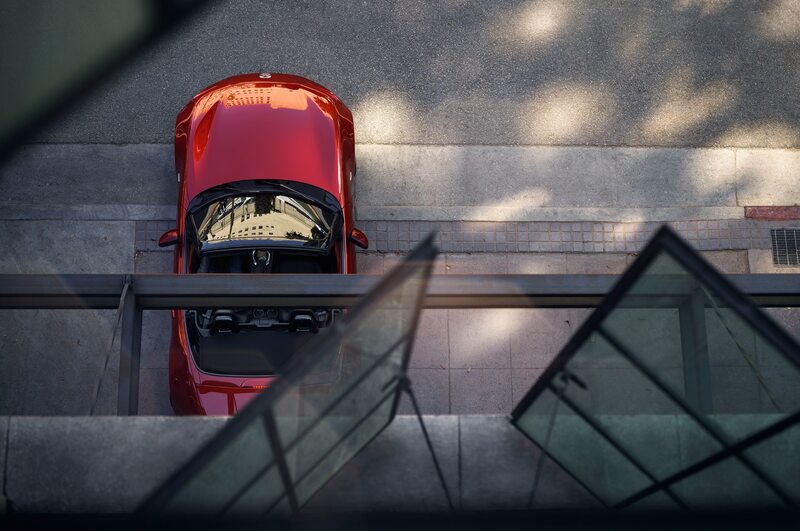 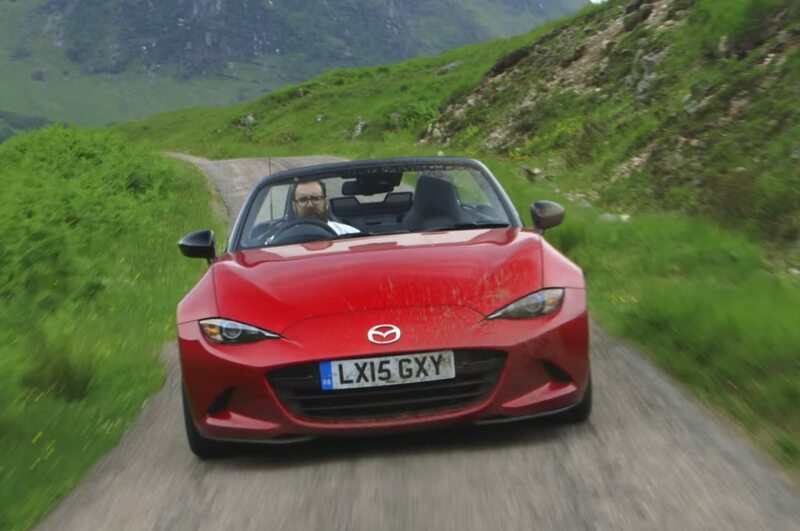 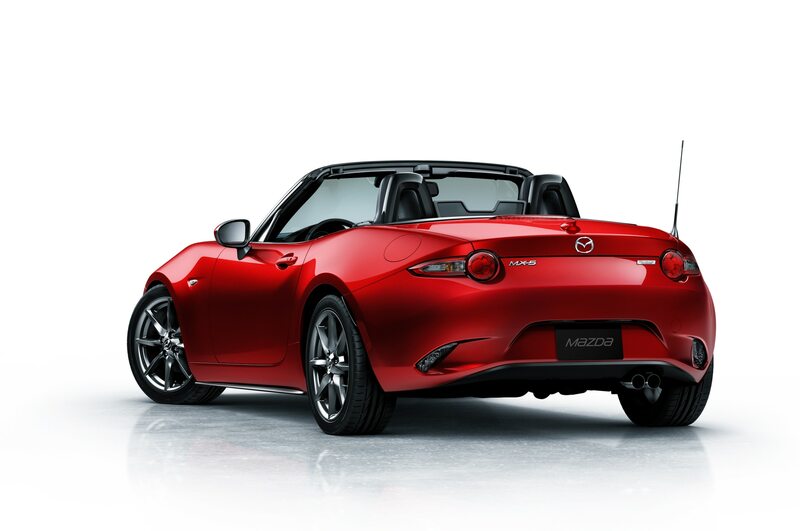 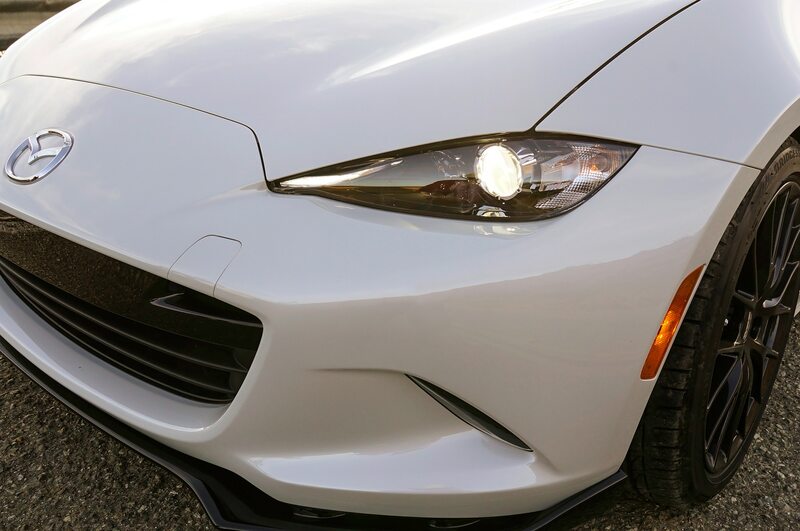 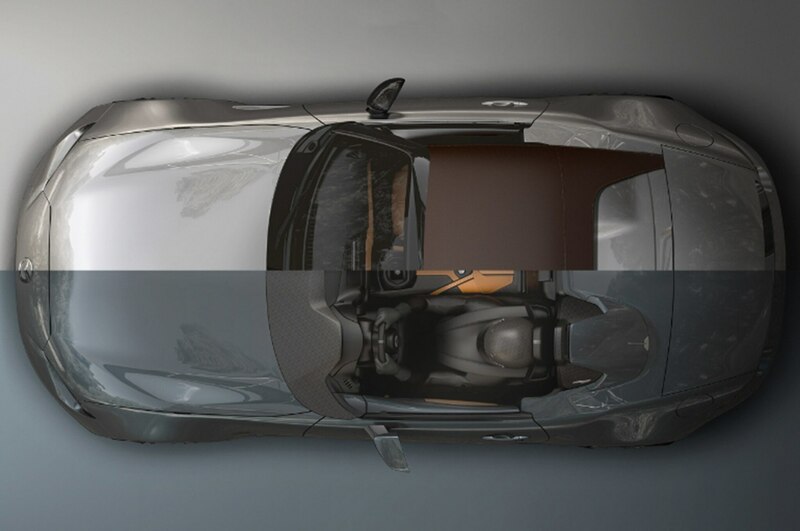 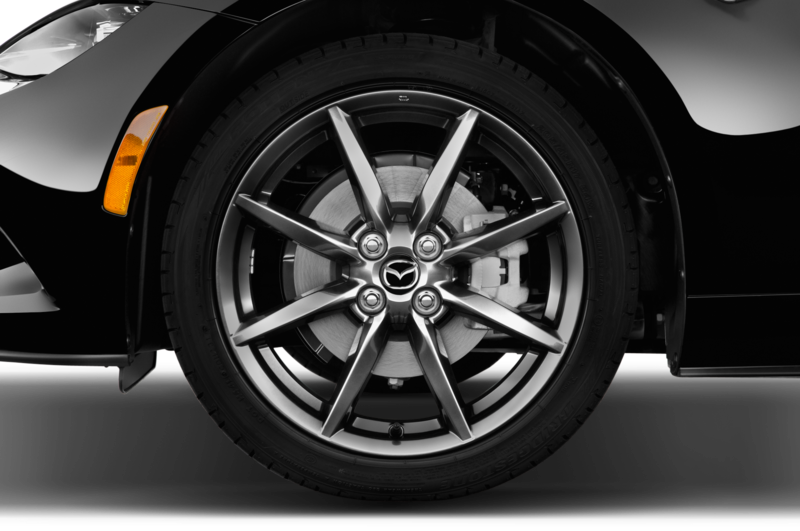 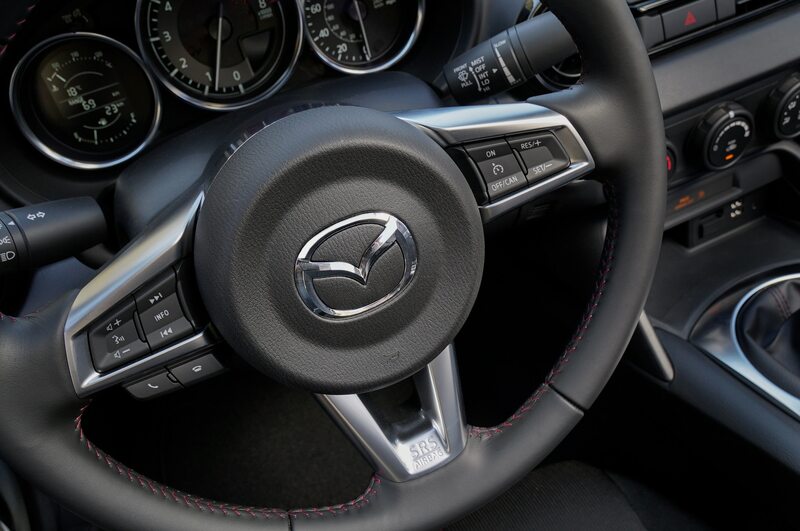 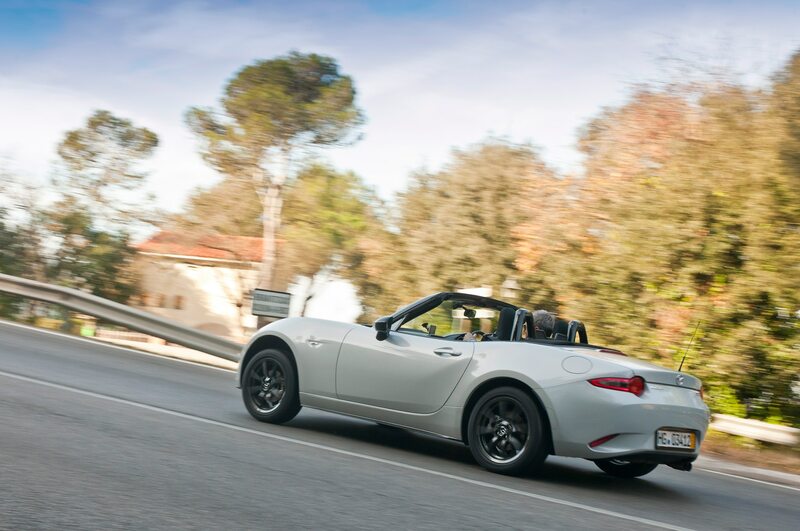 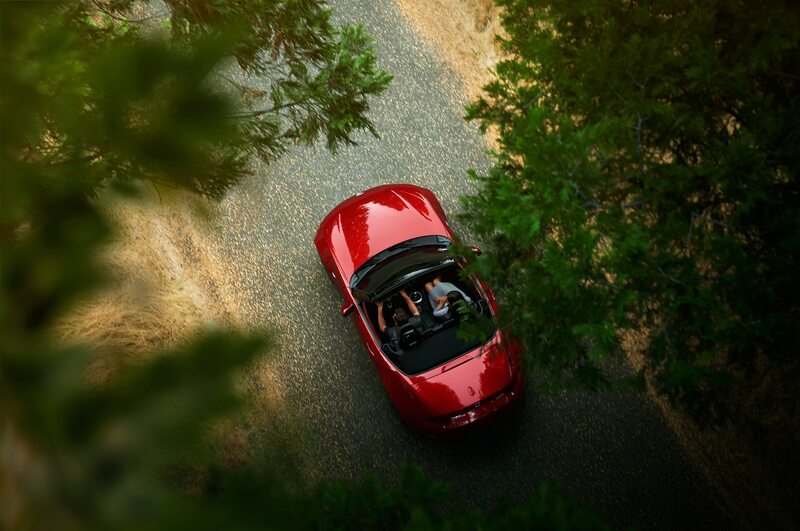 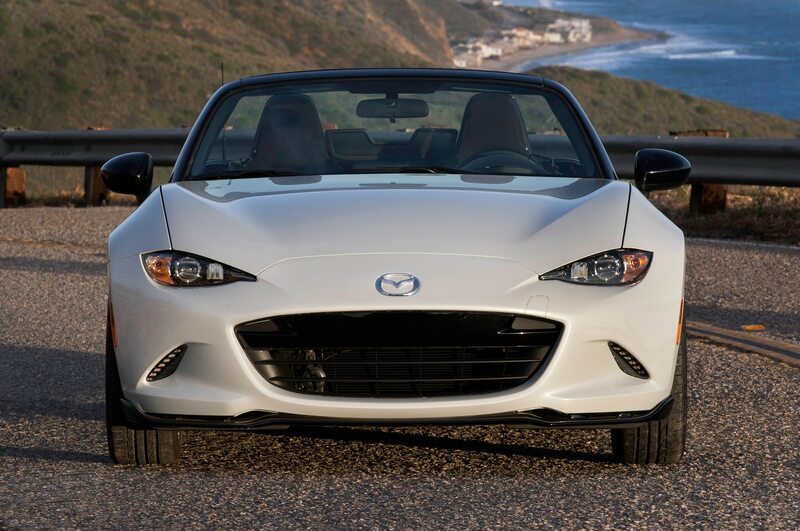 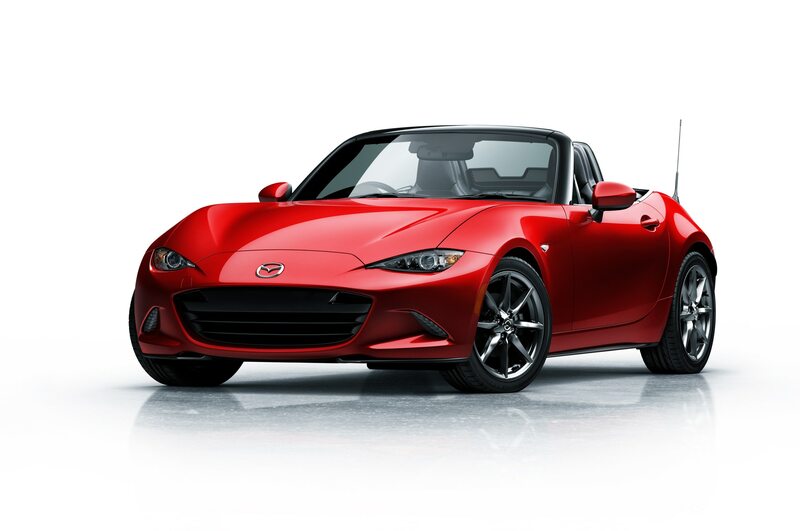 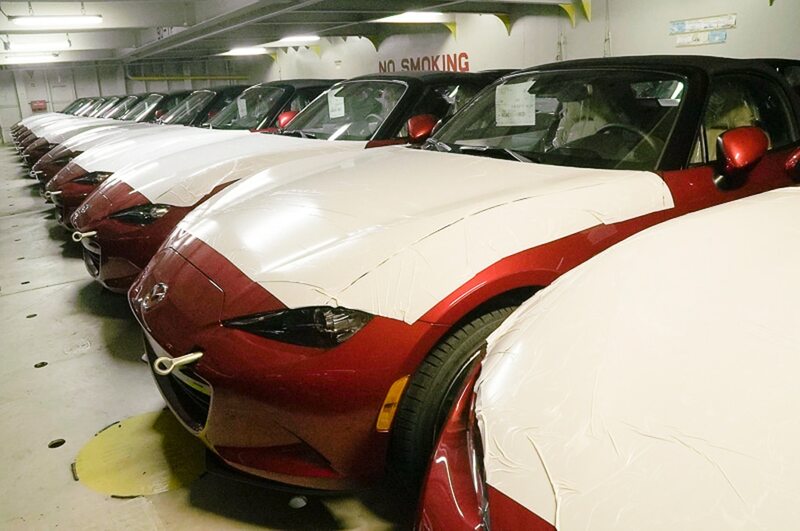 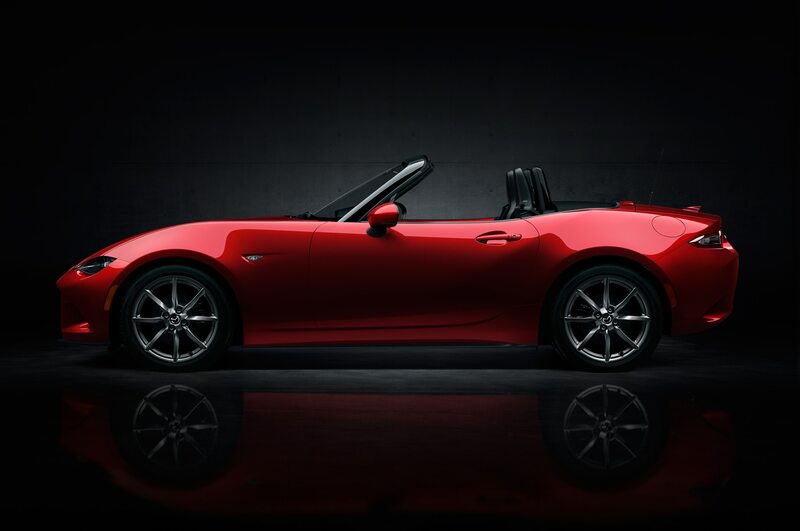 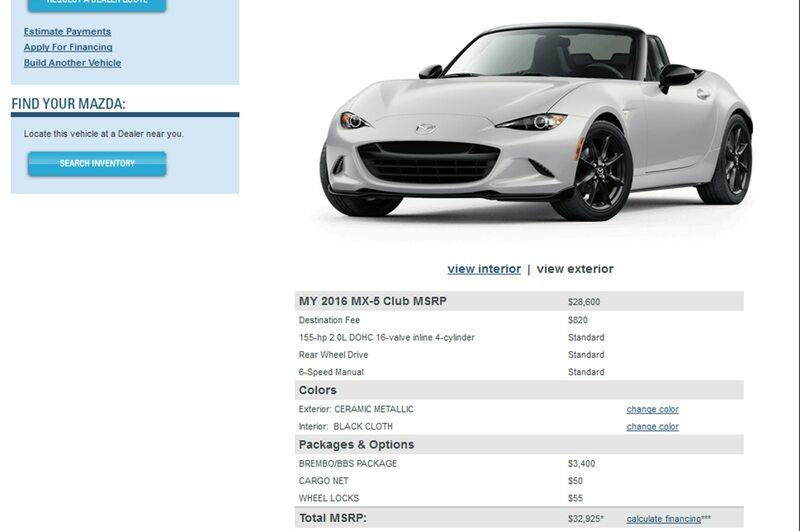 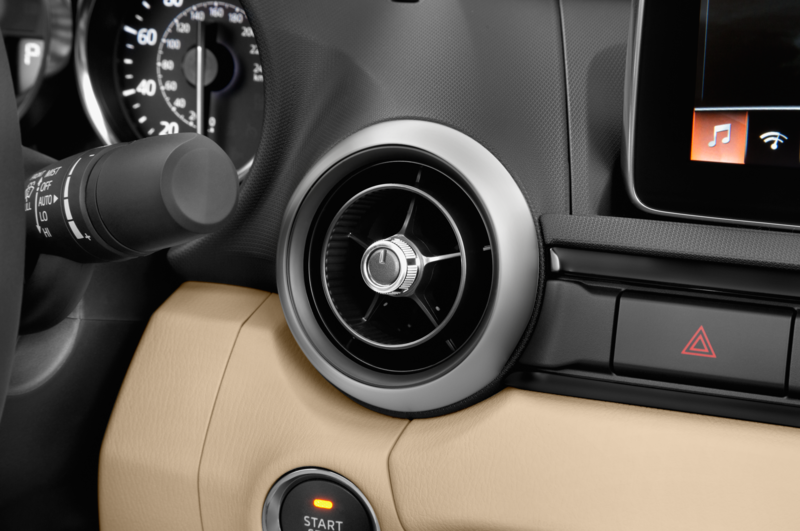 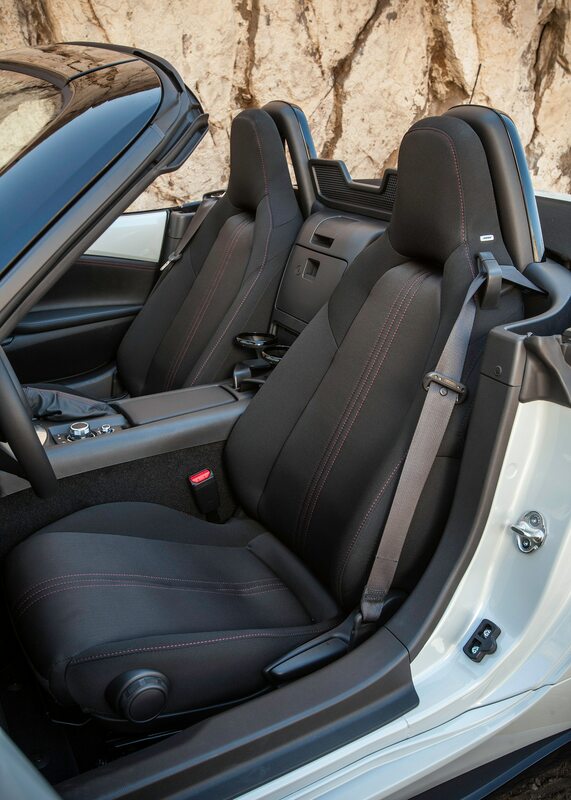 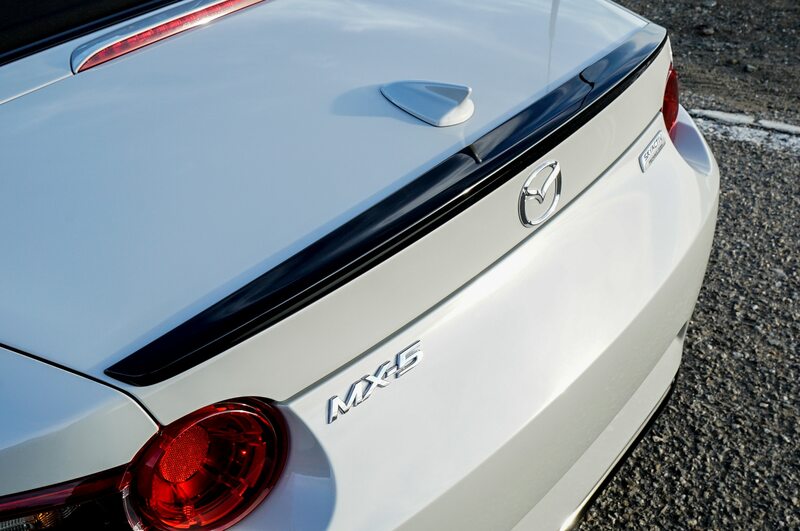 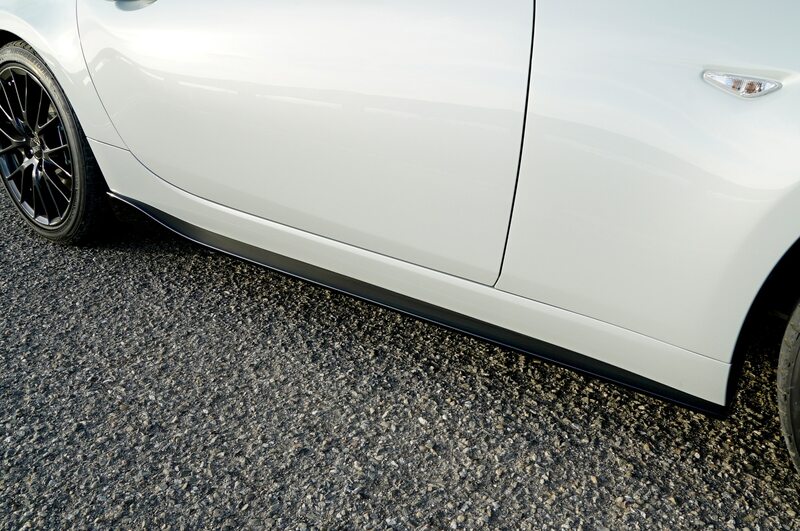 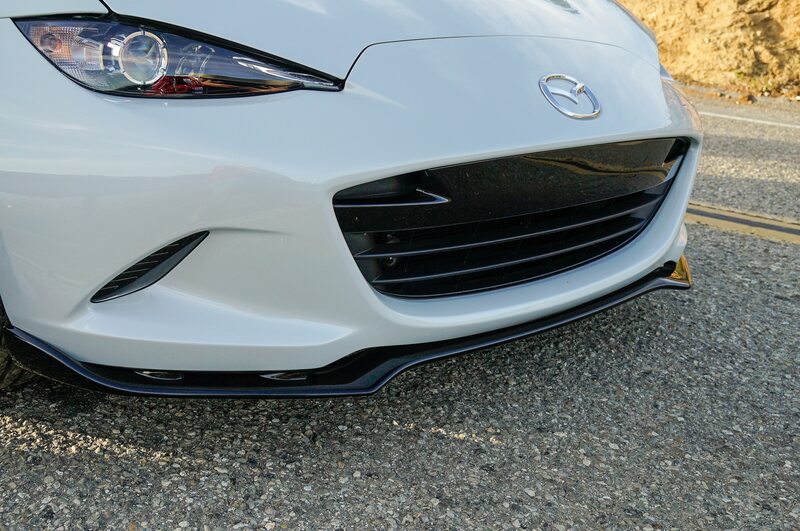 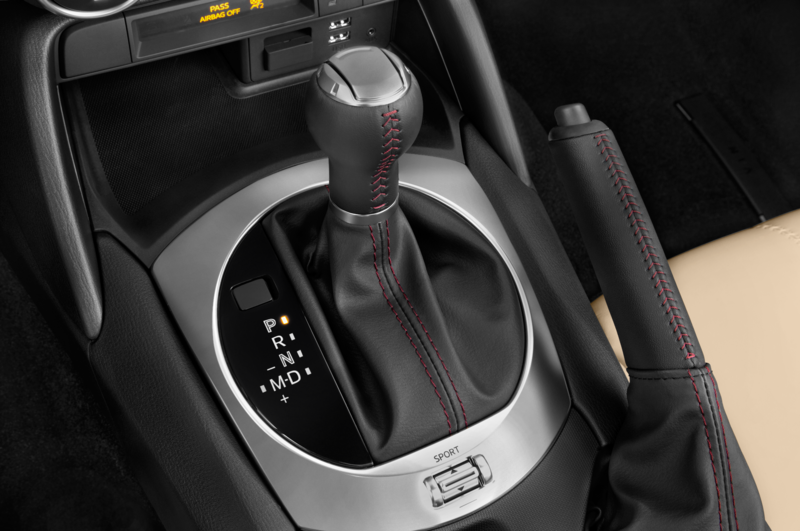 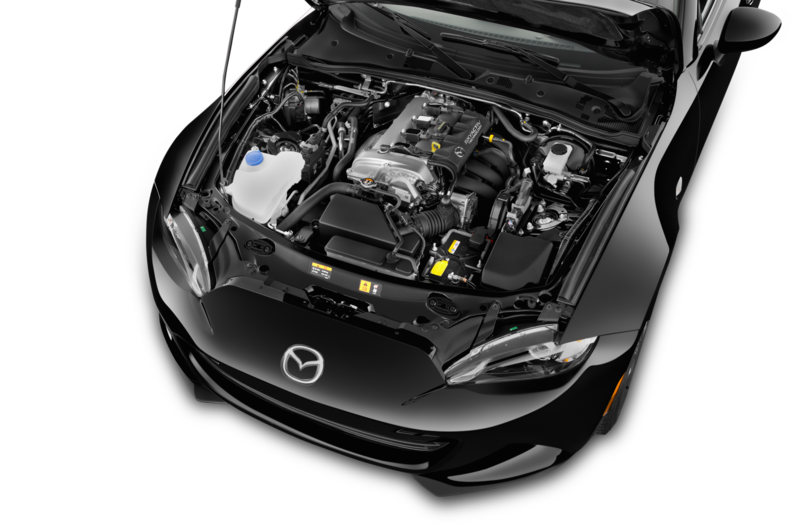 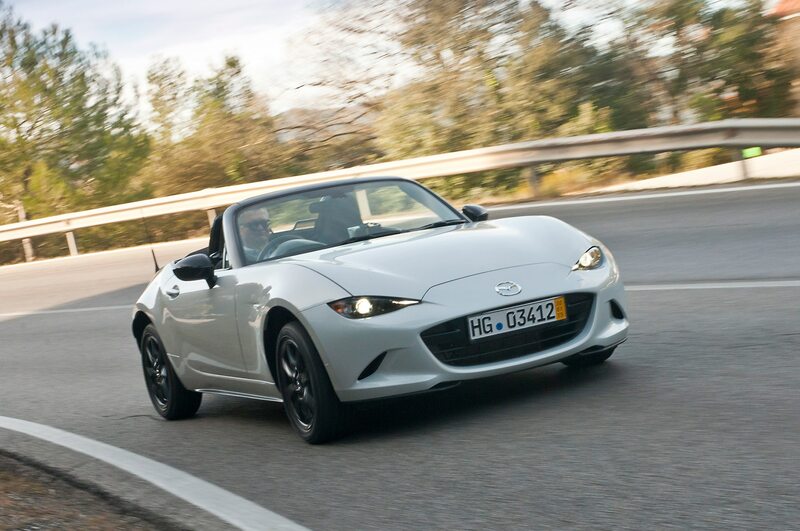 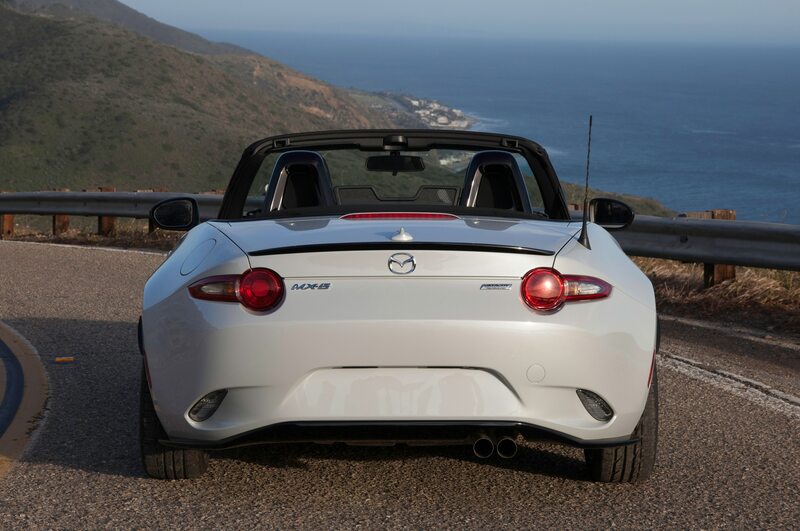 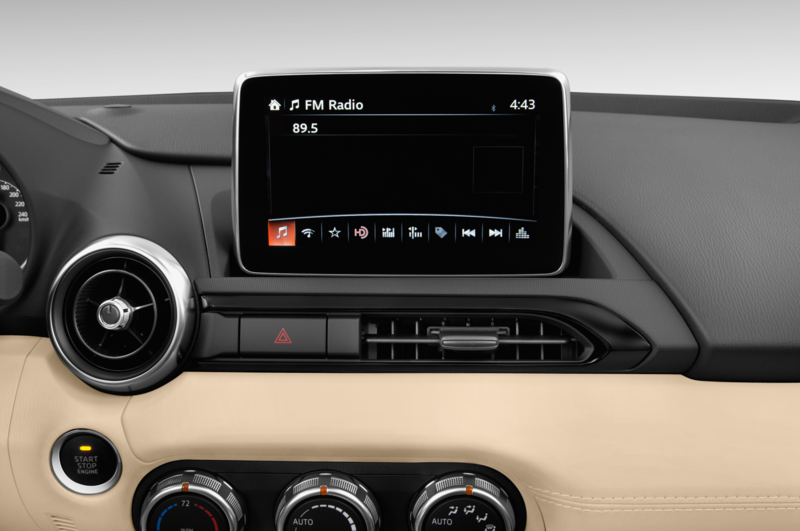 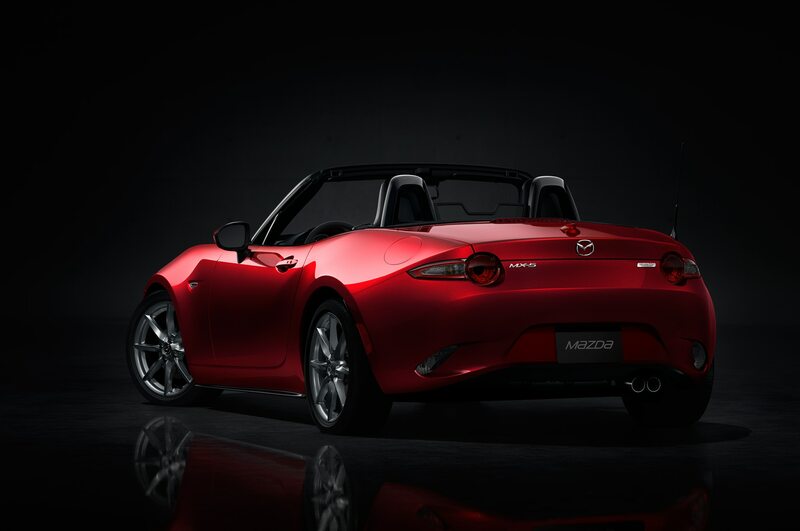 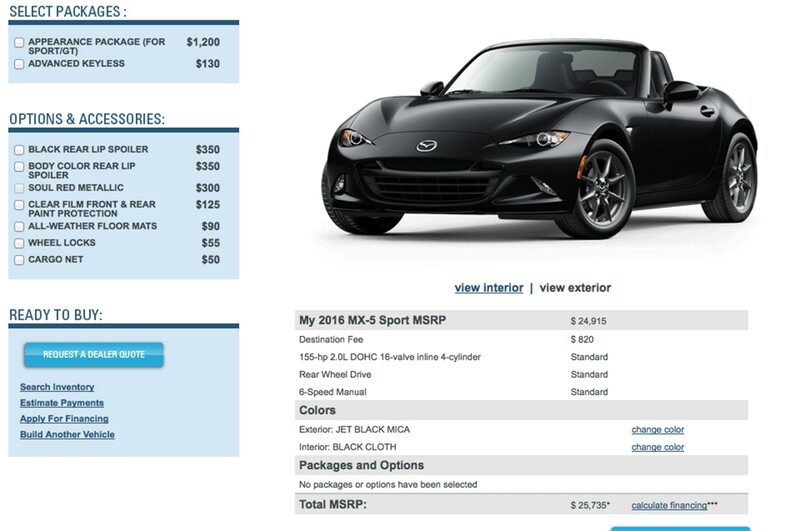 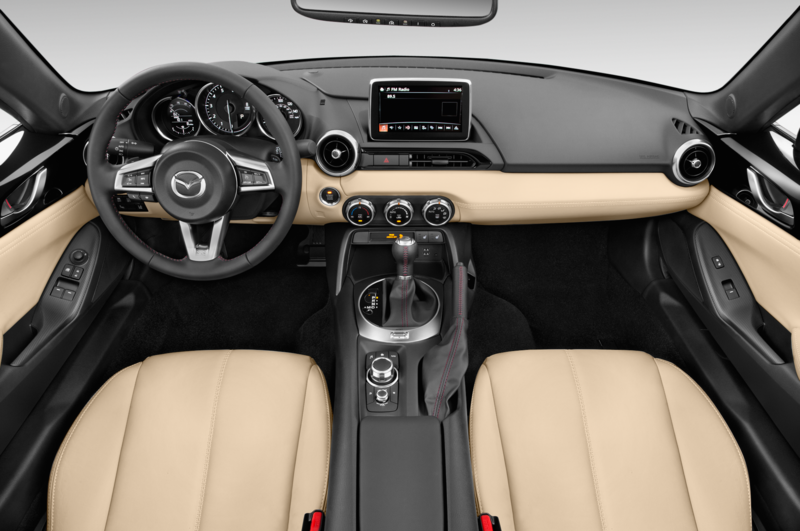 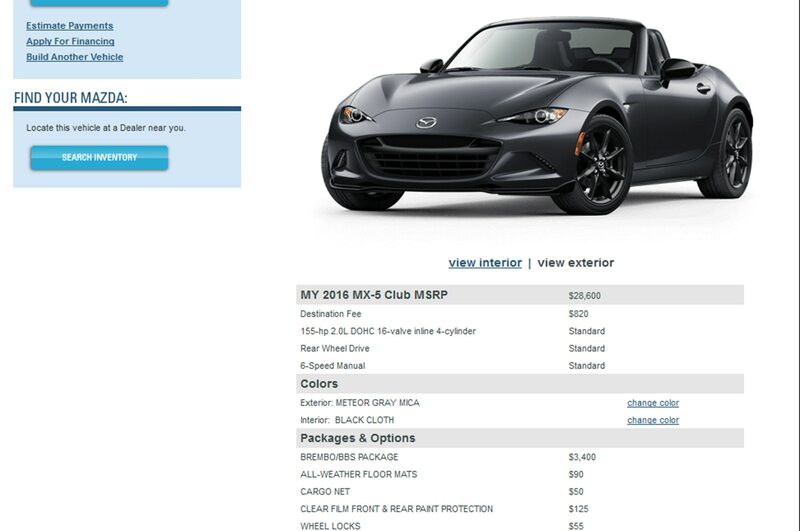 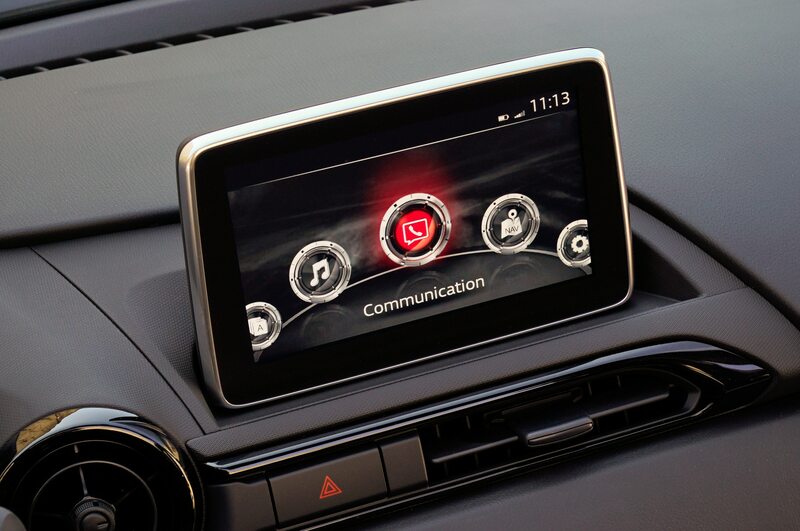 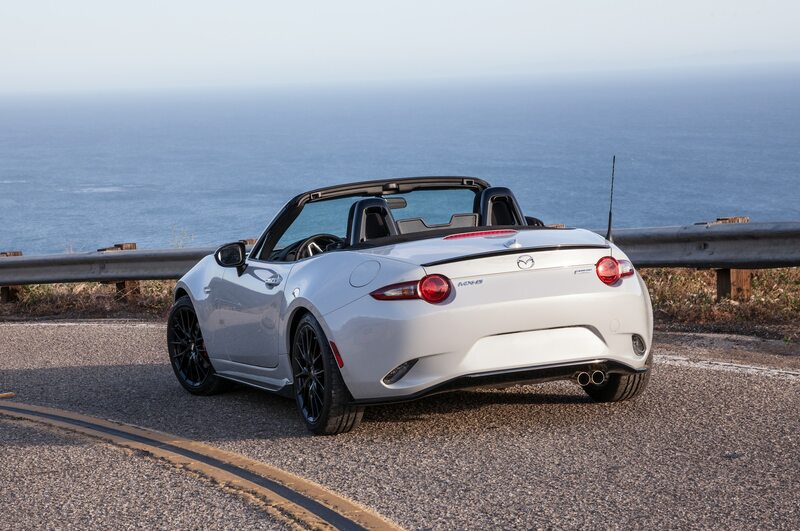 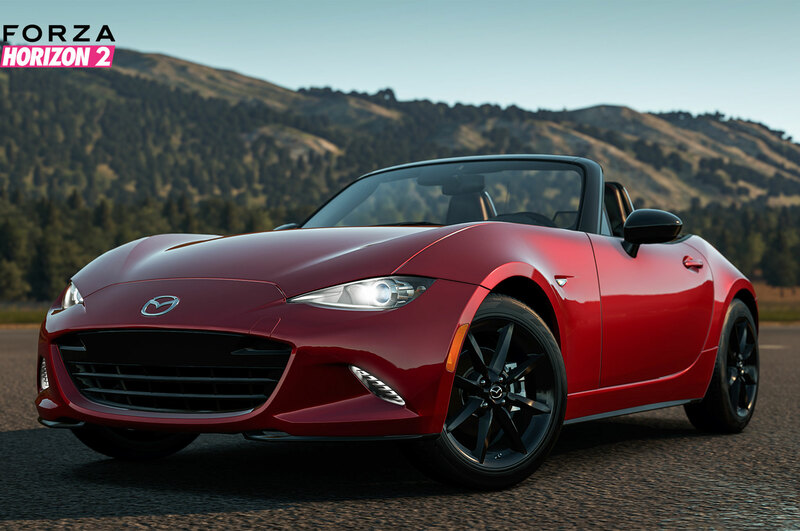 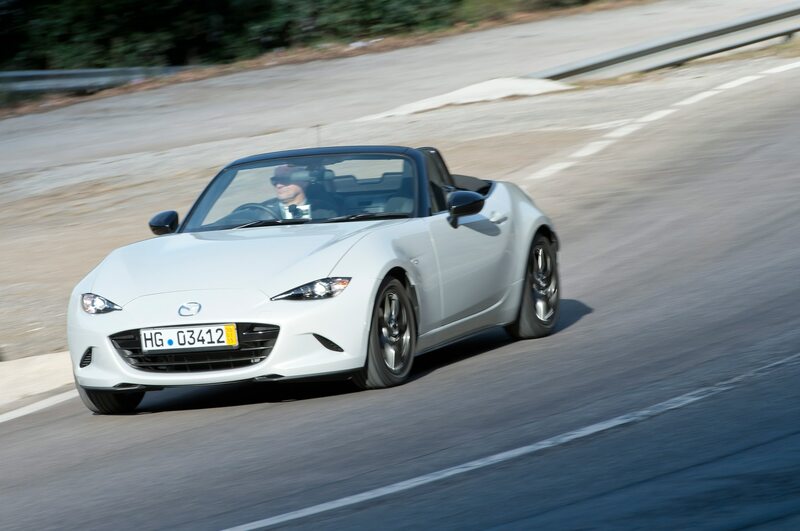 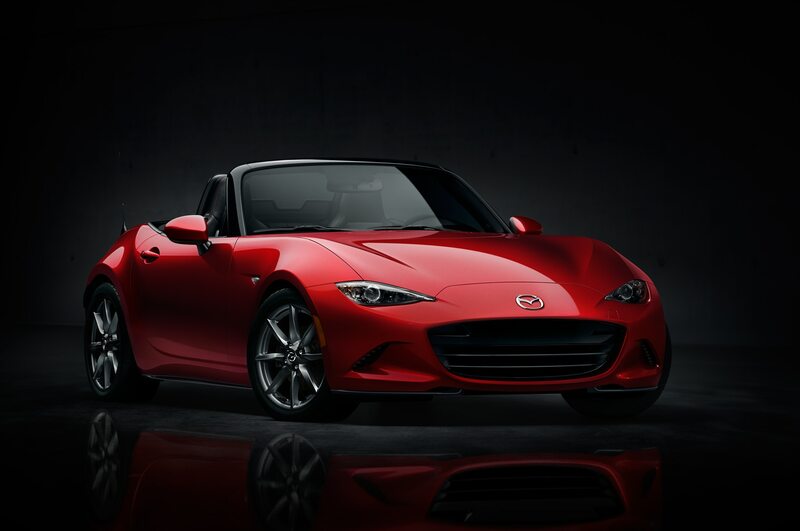 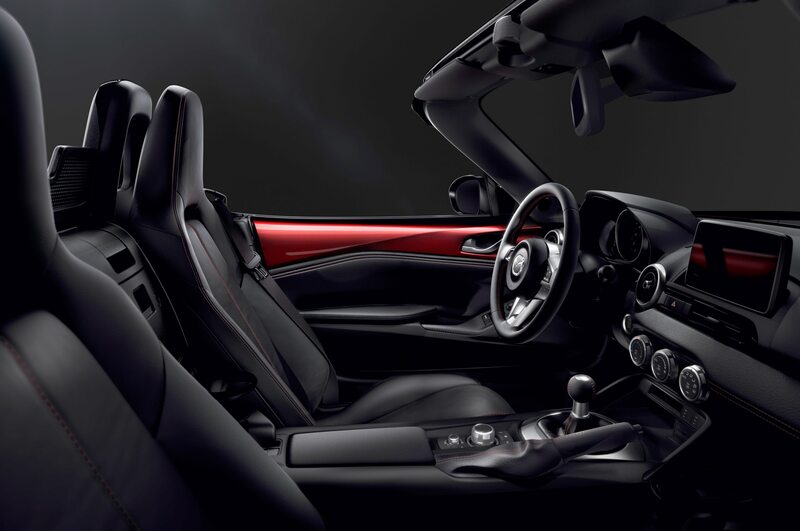 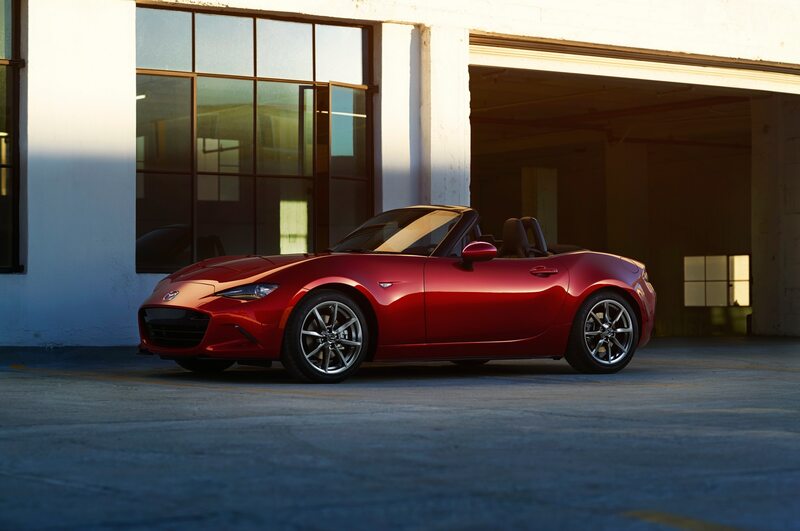 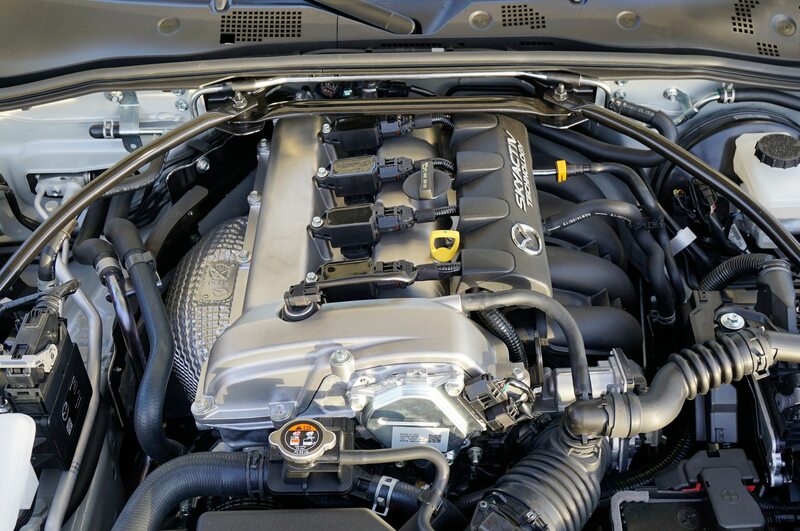 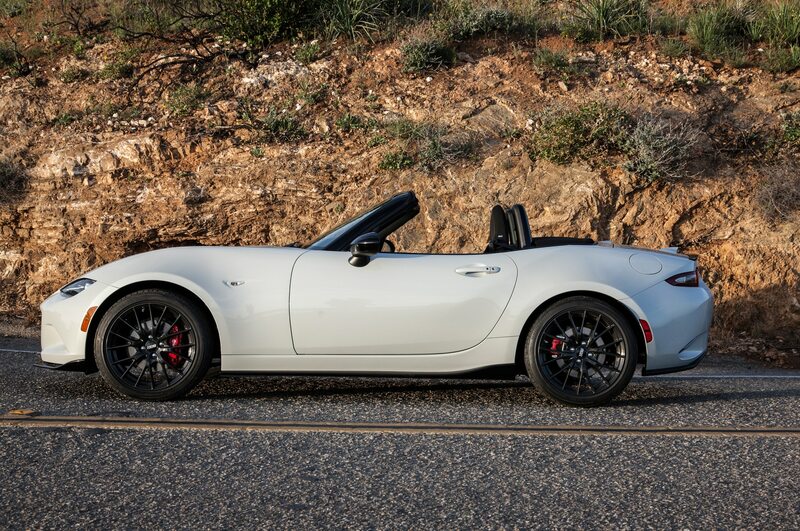 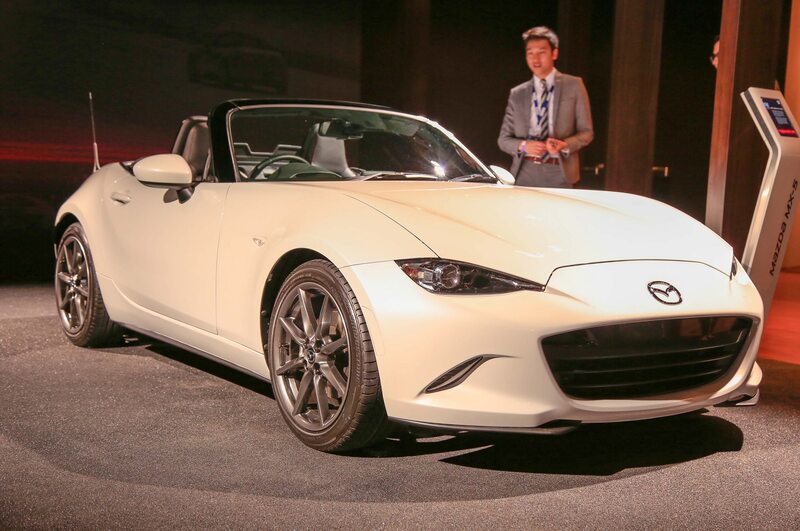 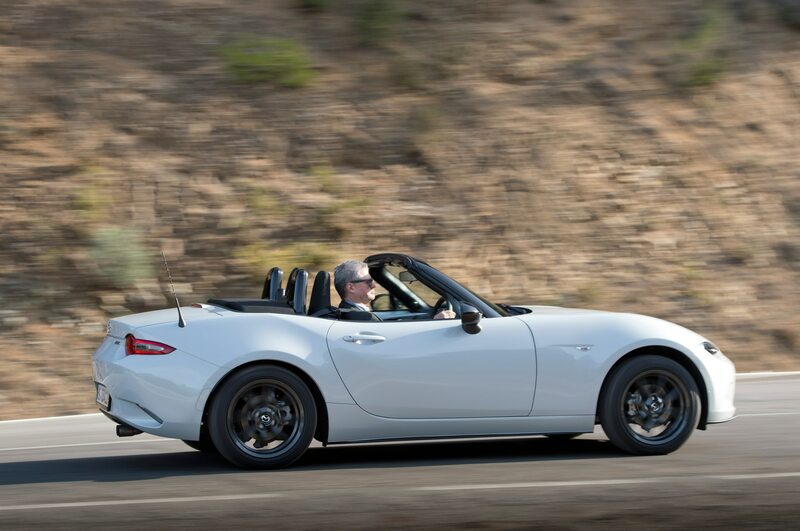 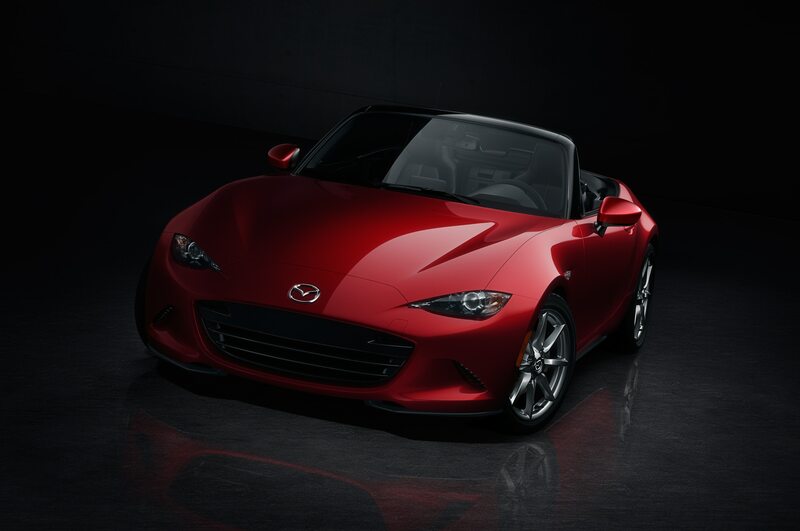 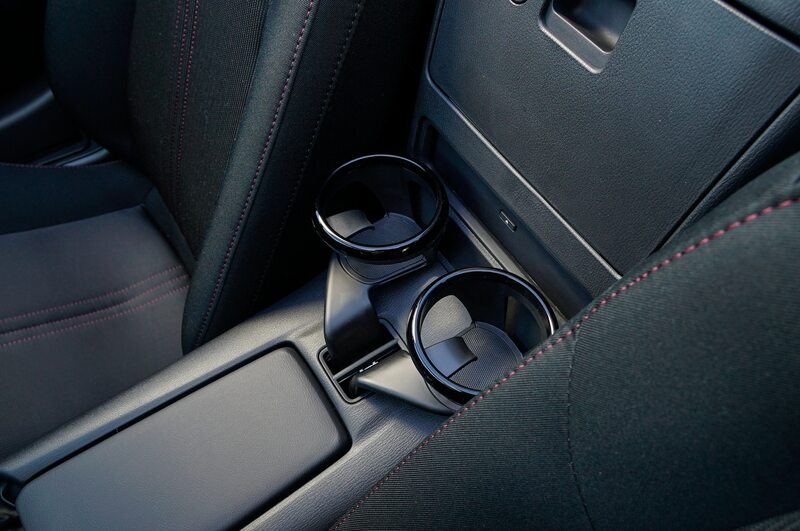 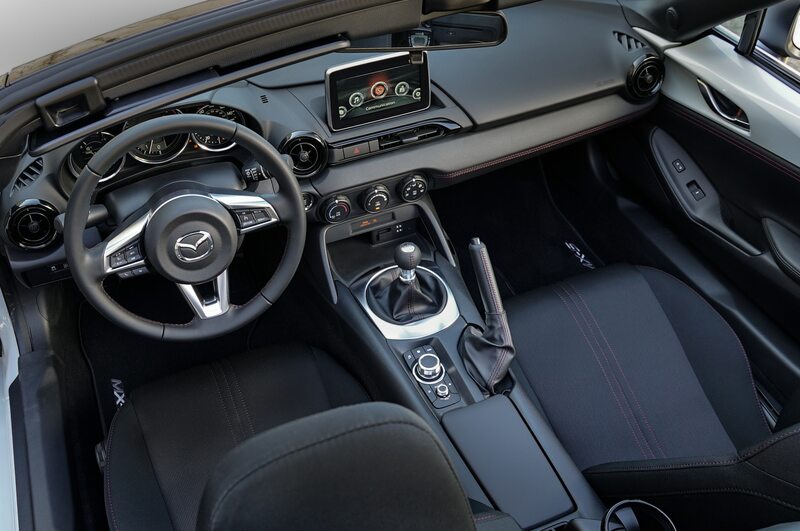 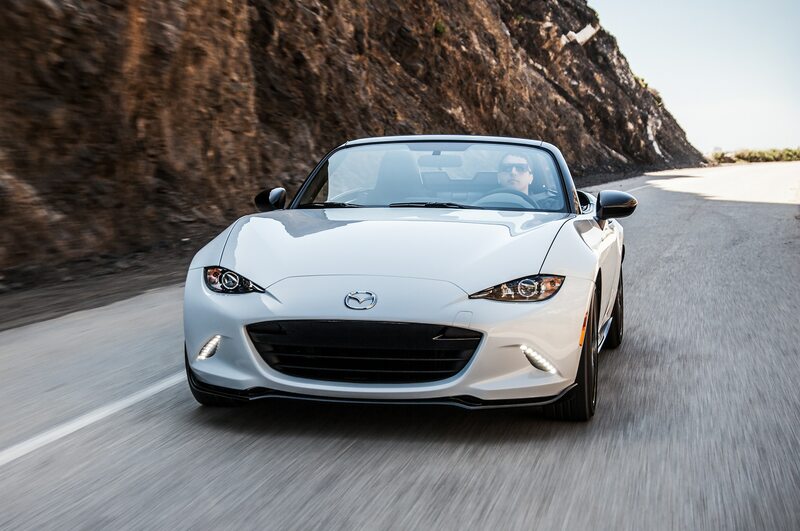 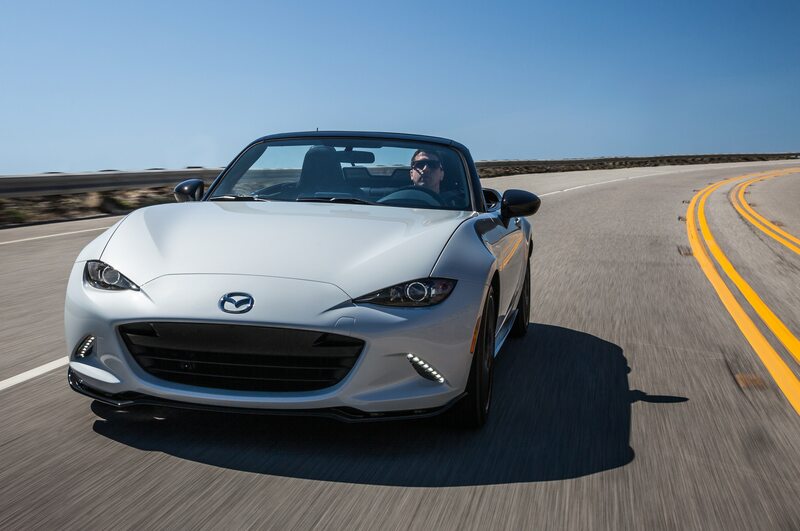 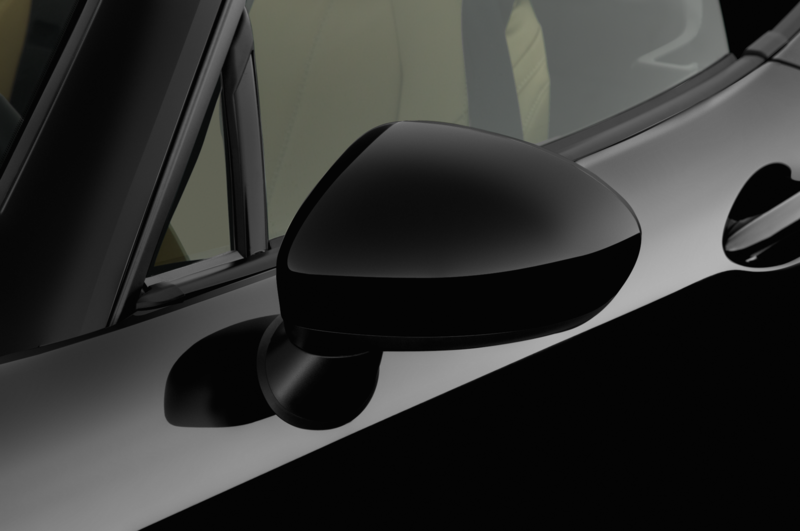 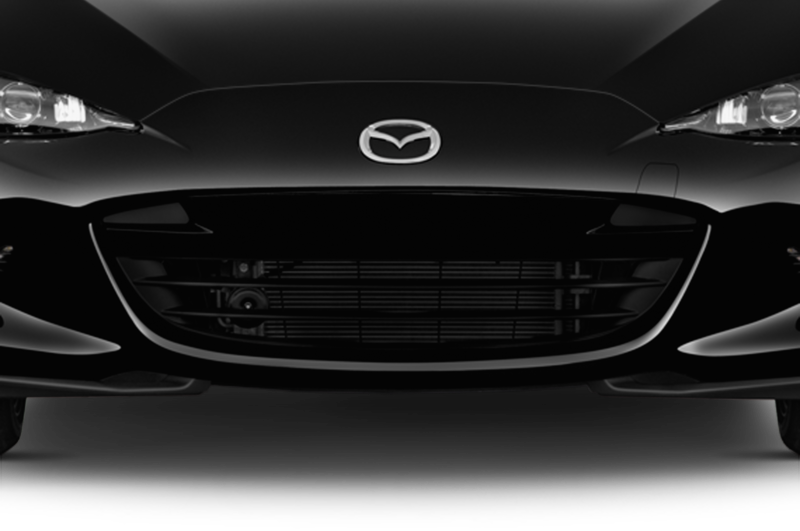 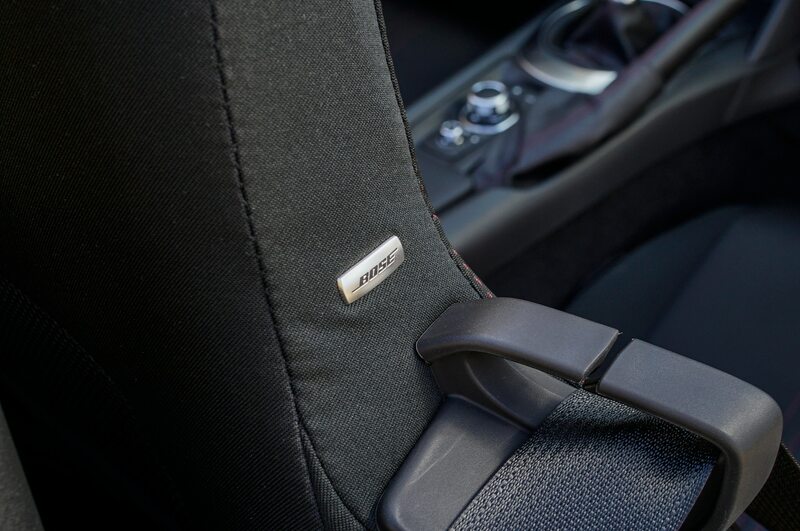 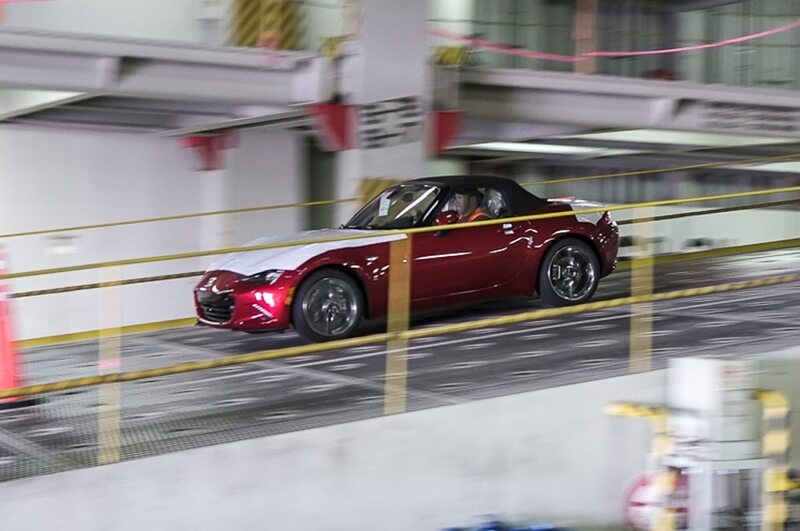 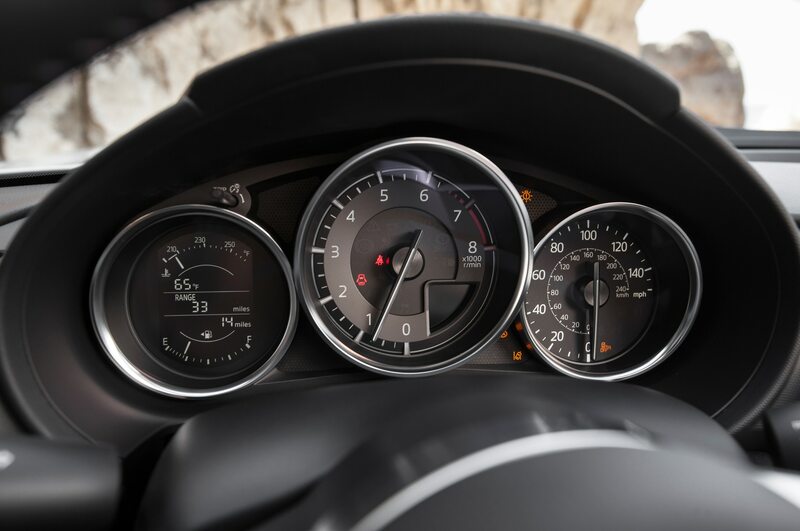 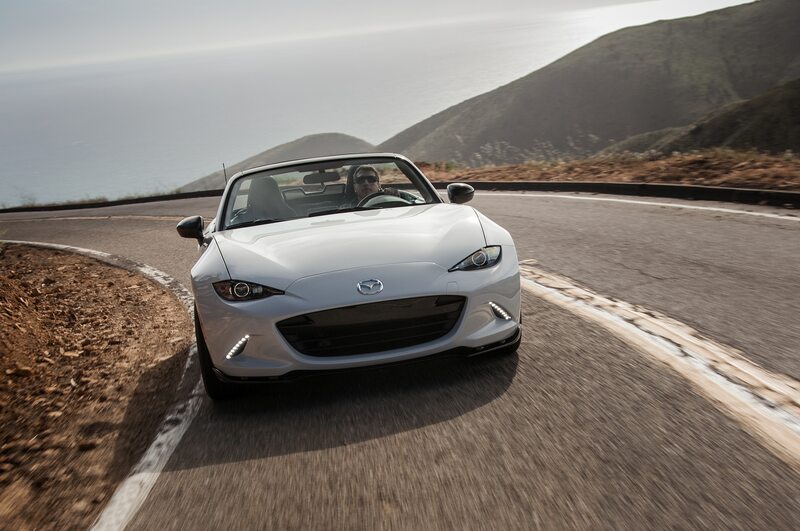 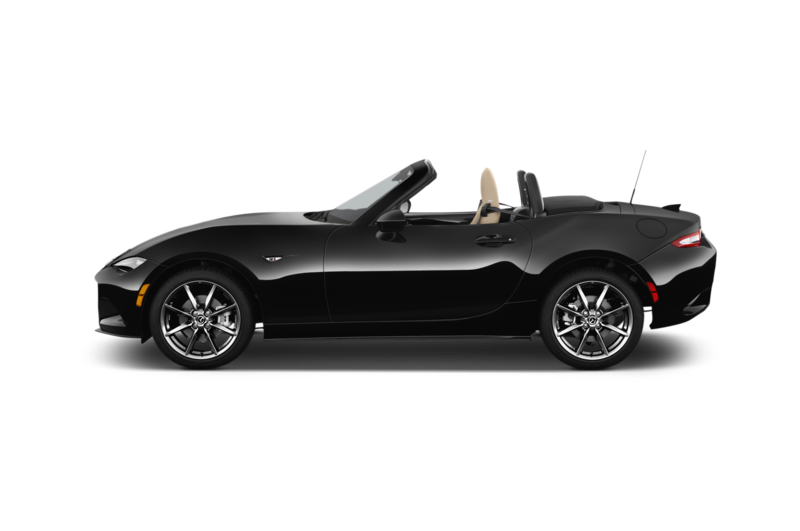 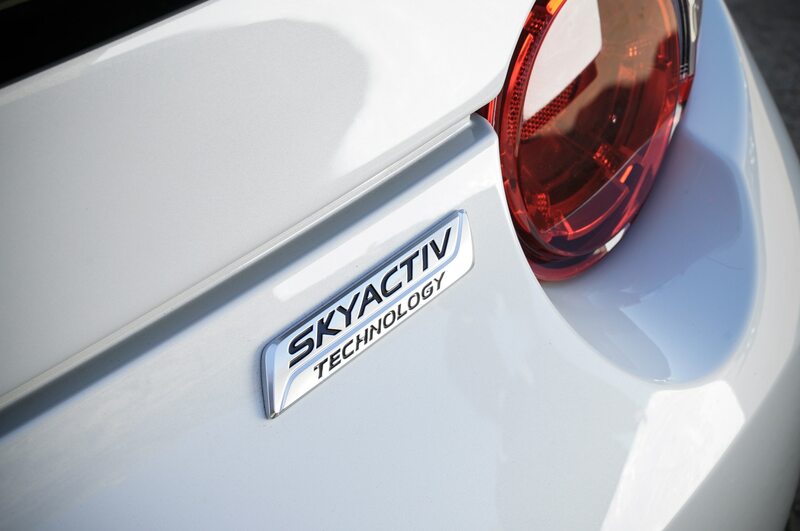 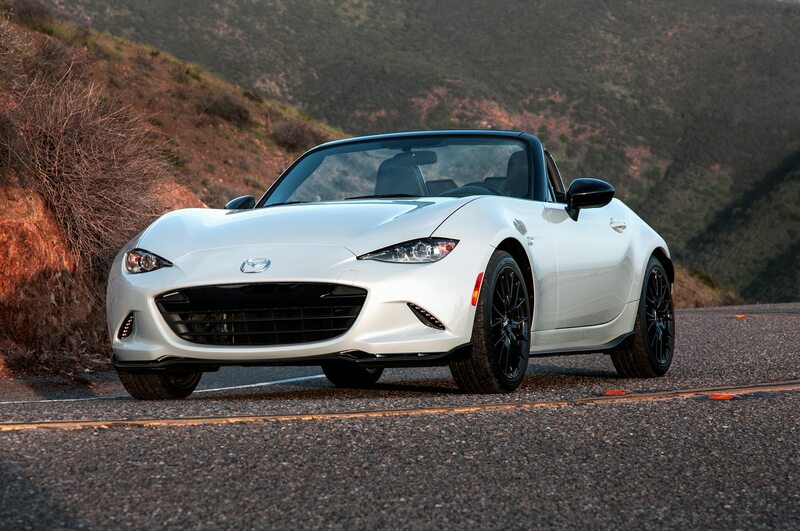 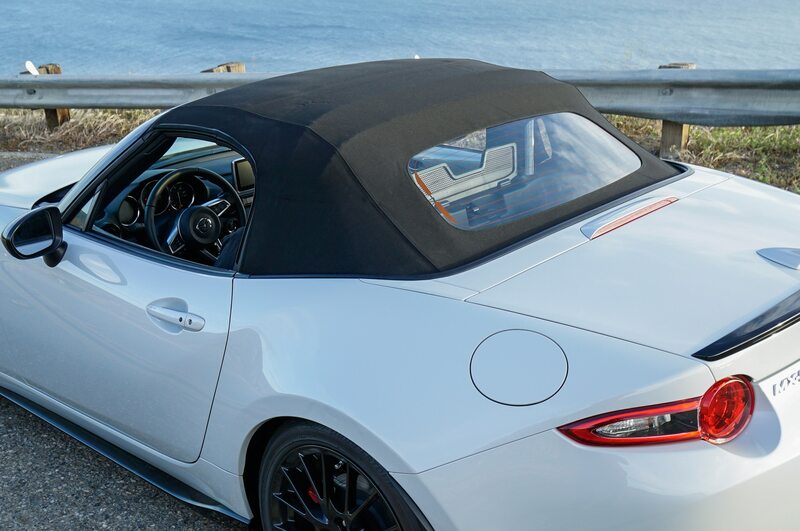 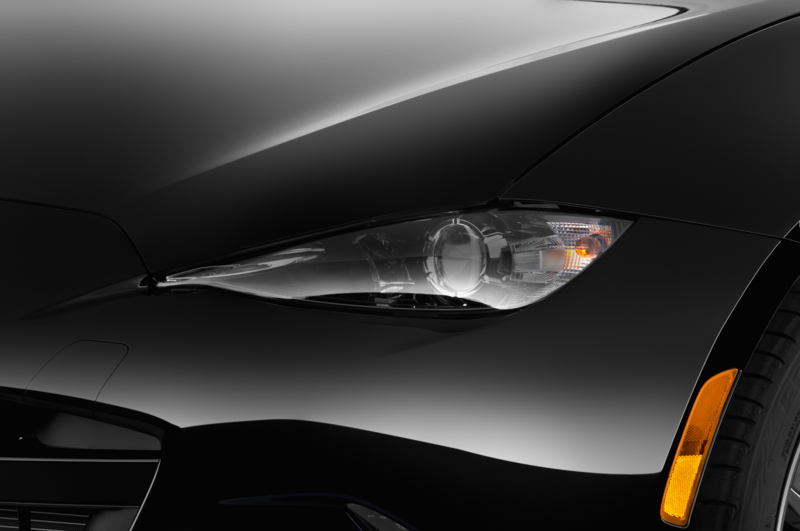 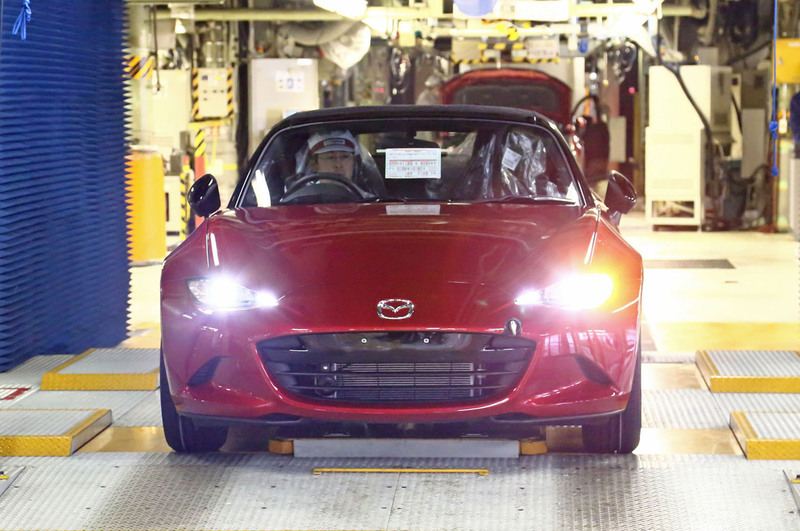 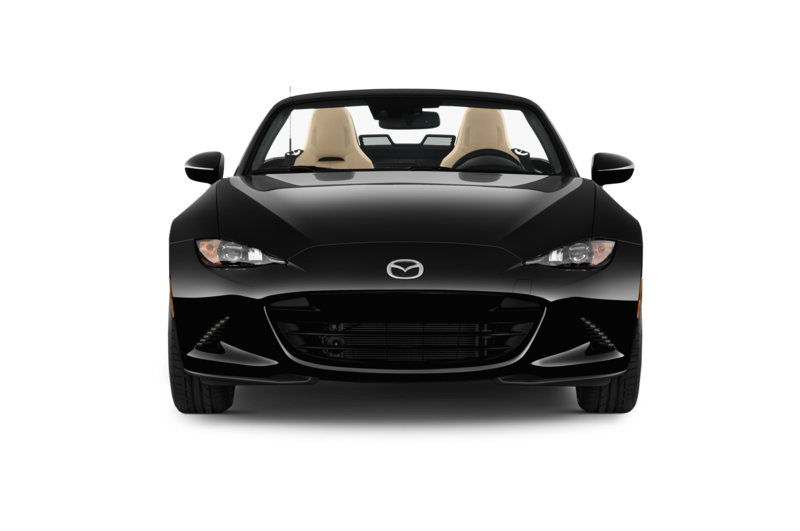 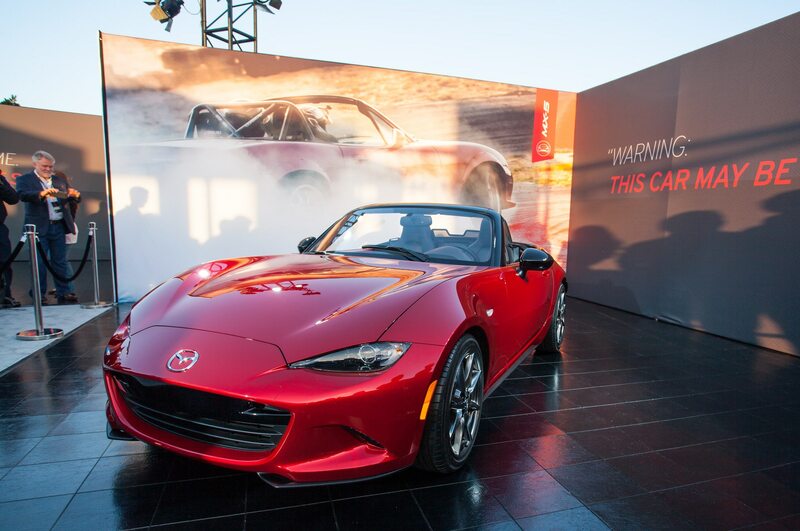 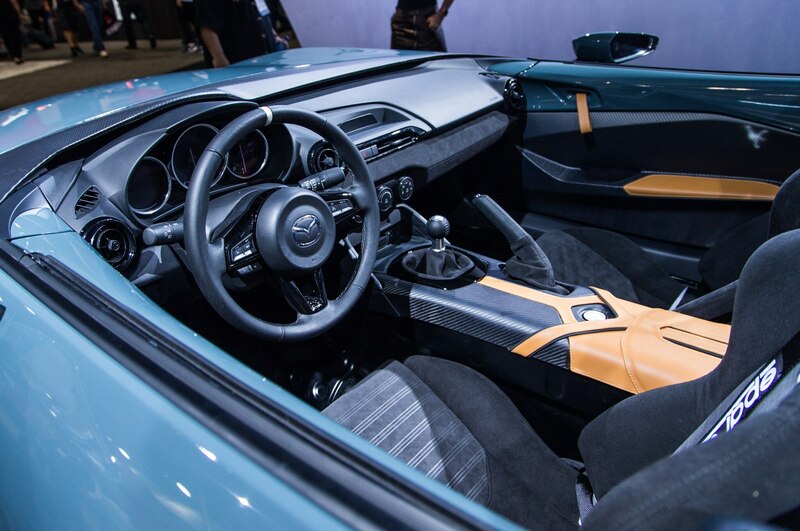 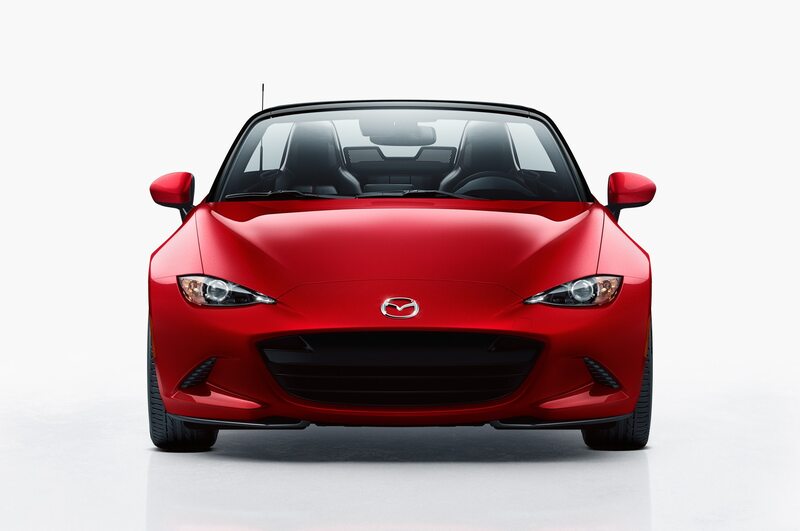 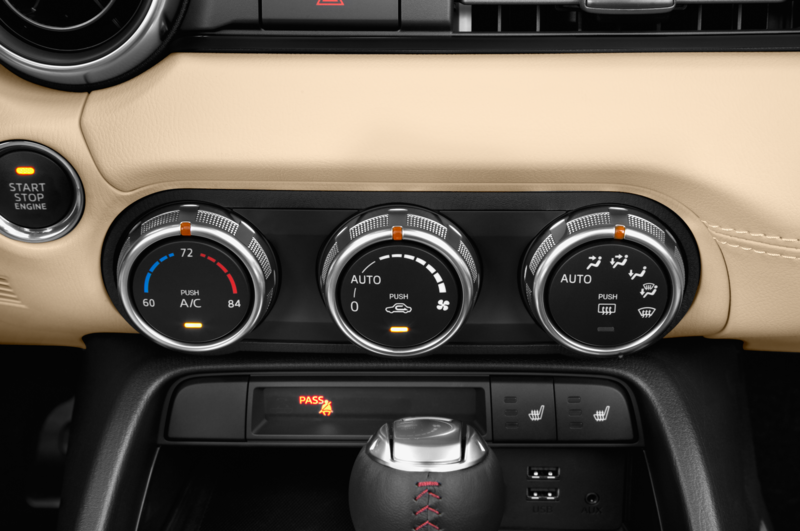 They removed the windshield and roof from a 2016 Mazda MX-5 Miata, leaving a small air deflector and roll hoops as the only nods to driver comfort and convenience. 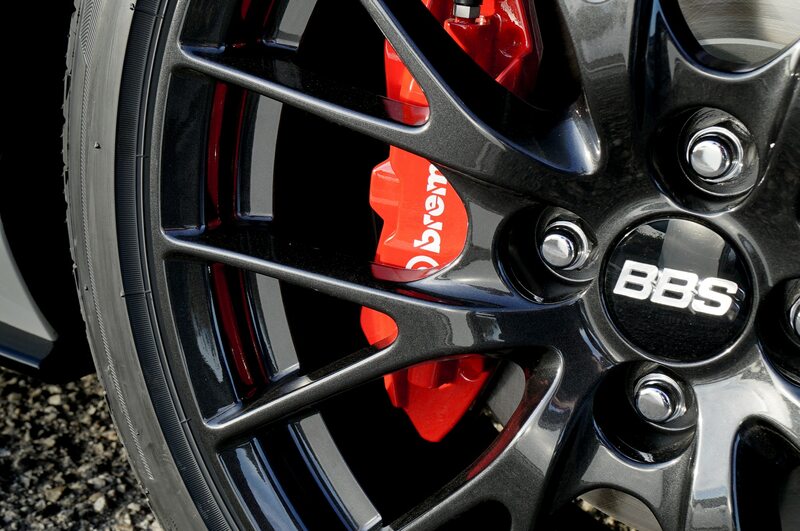 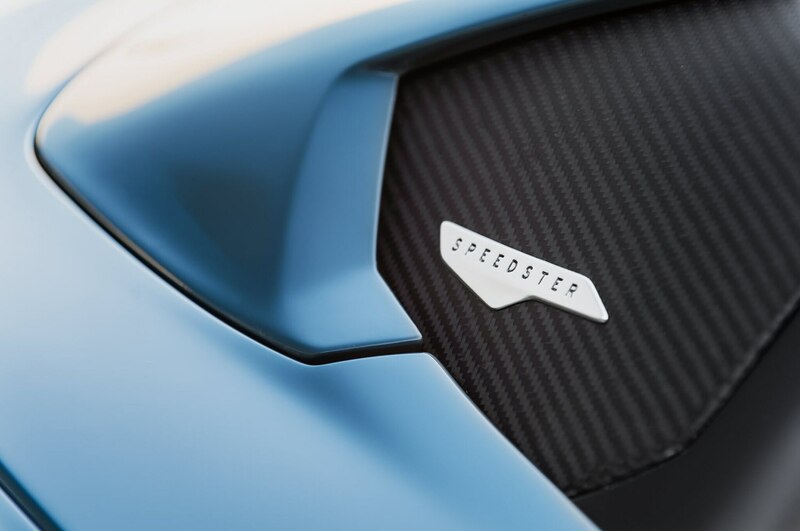 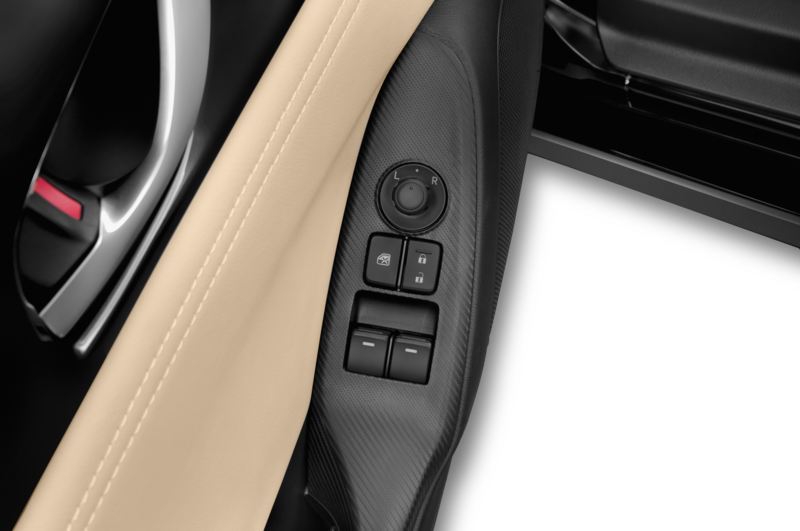 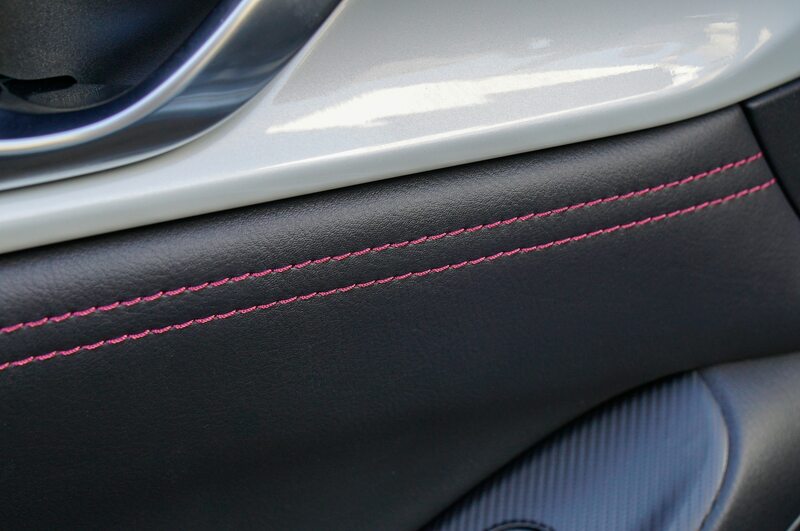 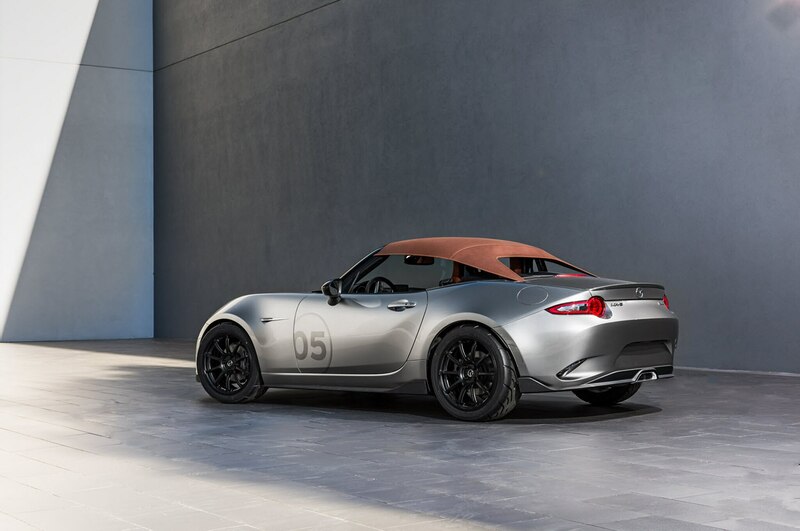 To further shed weight, the car wears lightweight Rays Extreme Gram Lights 16-inch wheels, carbon-fiber seats trimmed in Alcantara, carbon-fiber door panels, and a lightweight Racing Beat center-exit exhaust. 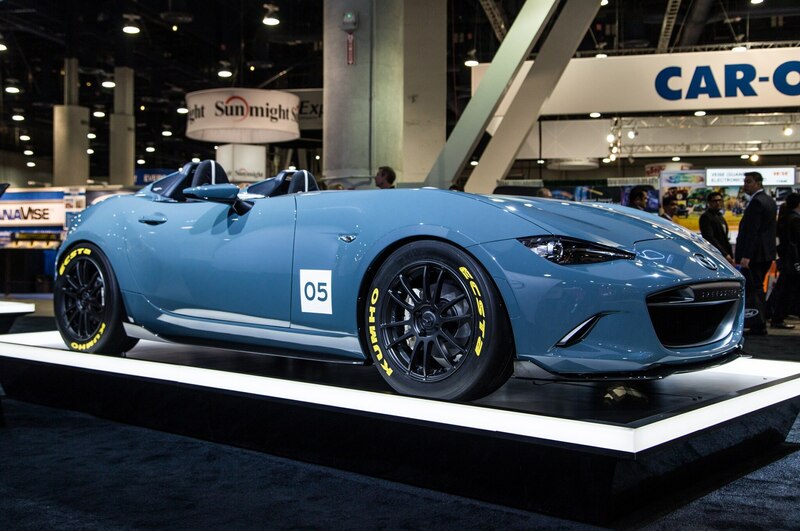 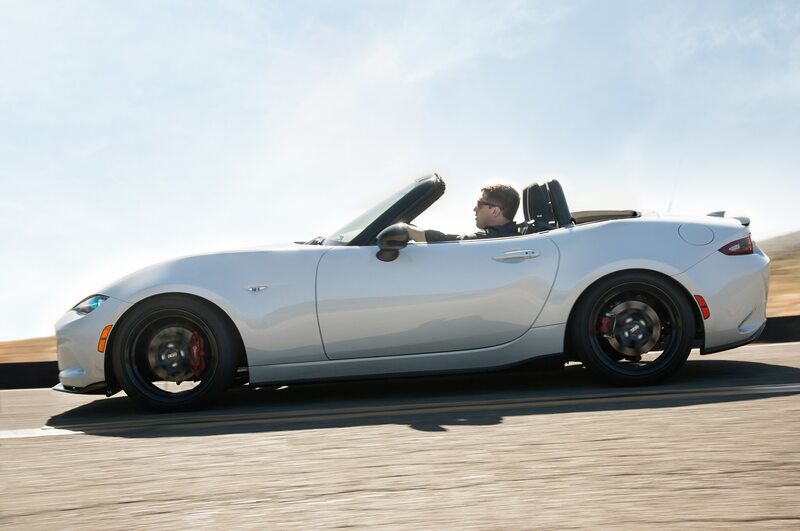 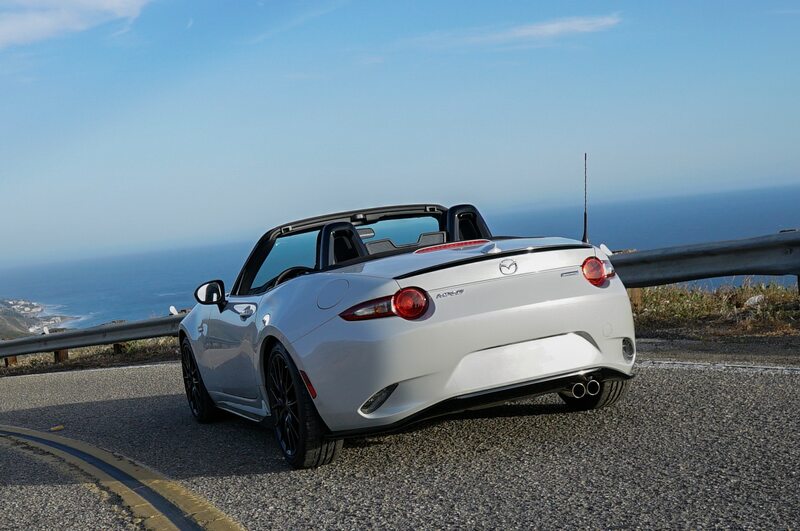 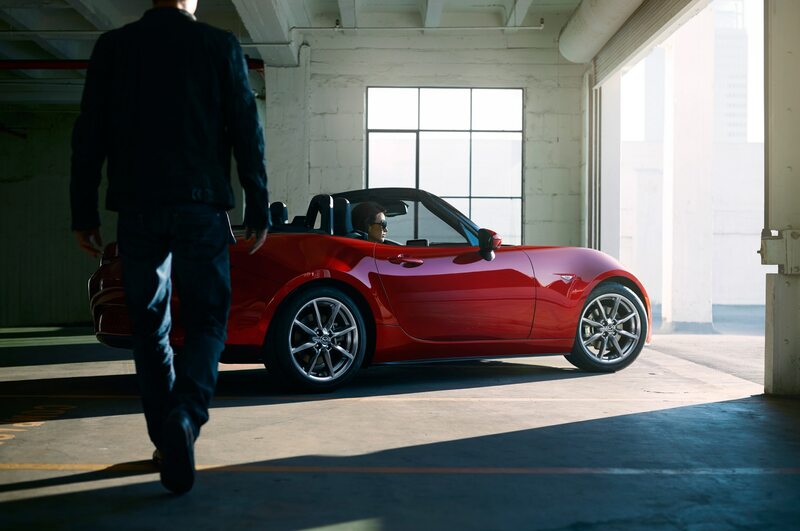 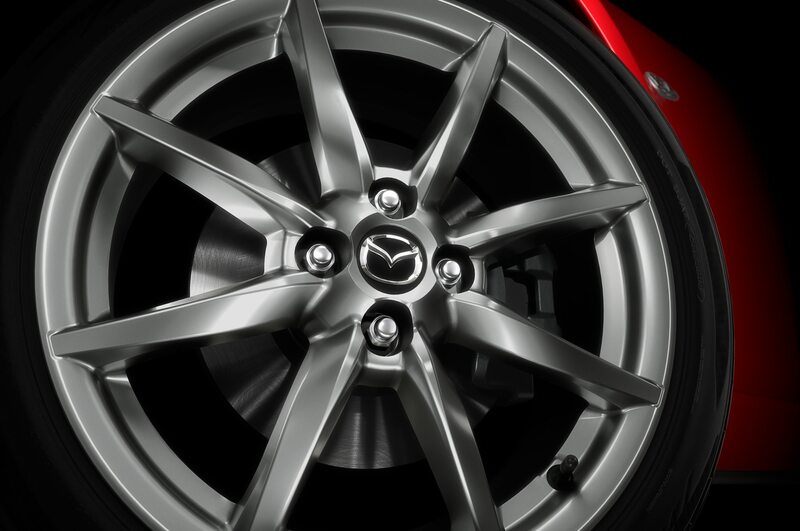 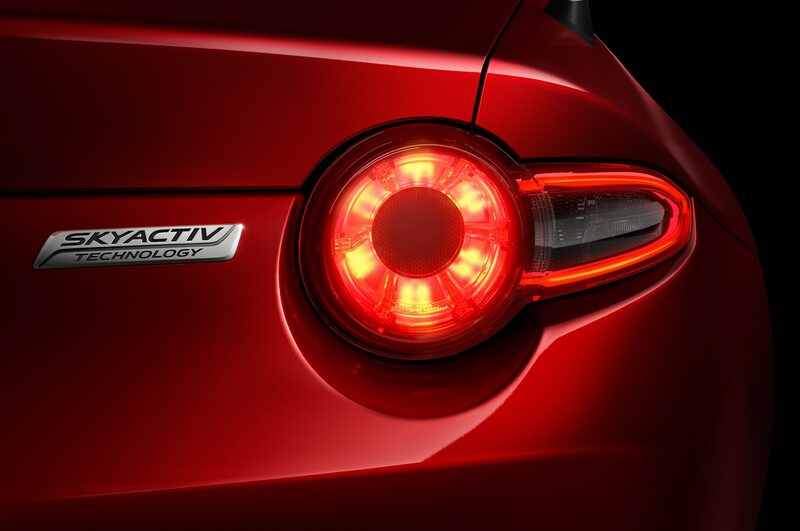 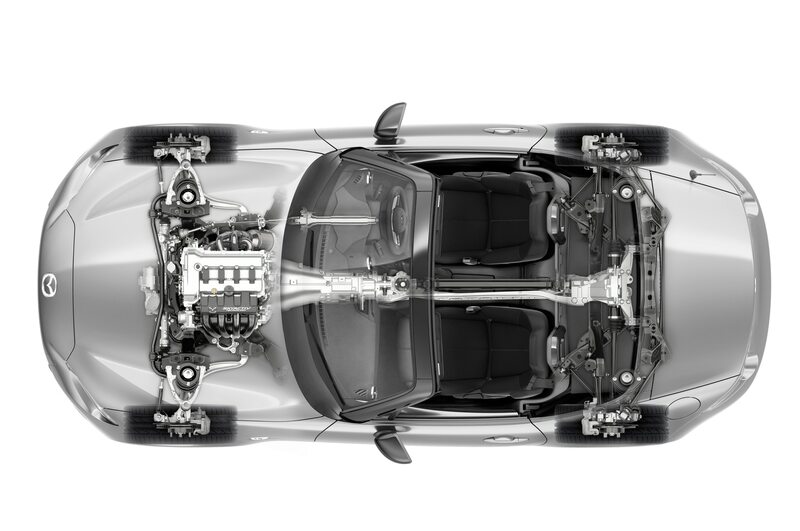 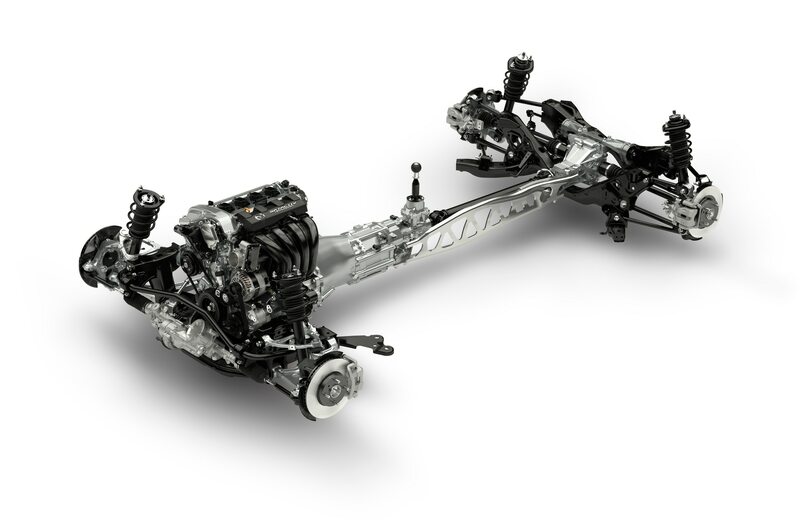 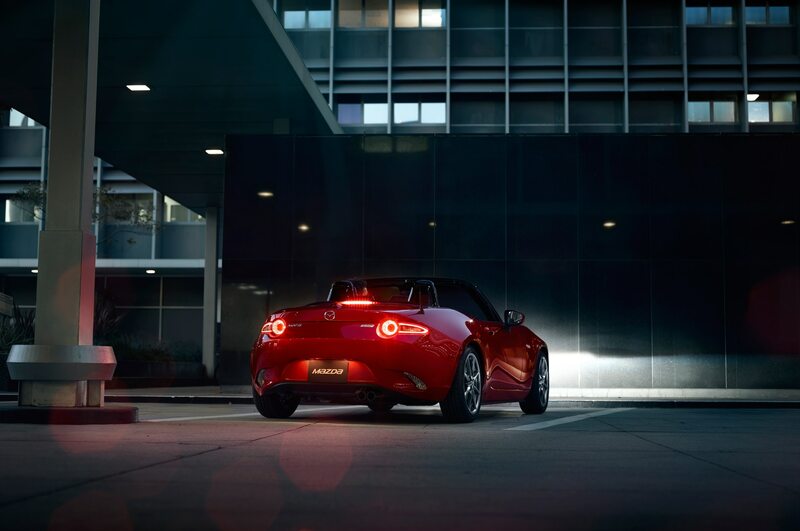 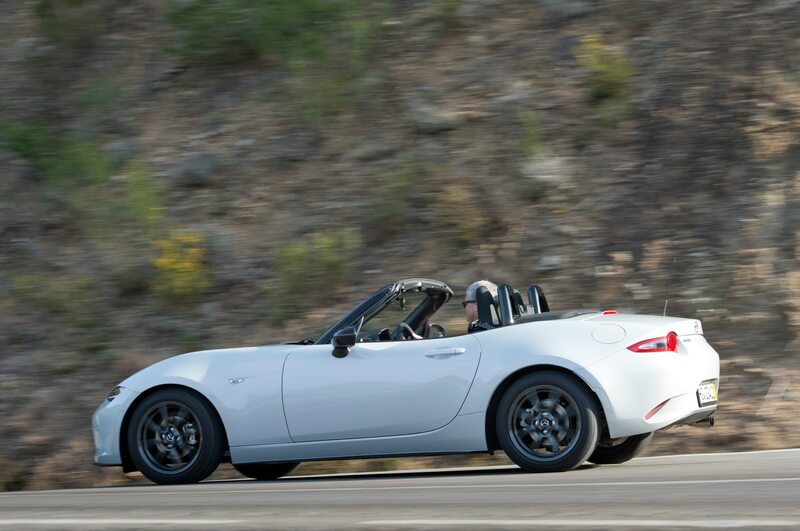 Along with a K&W adjustable coilover suspension that lowers the car by 1.2 inches, curb weight drops to an incredible 2,080 lb — a whole 252 lb lighter than a standard 2016 Mazda MX-5 Miata. 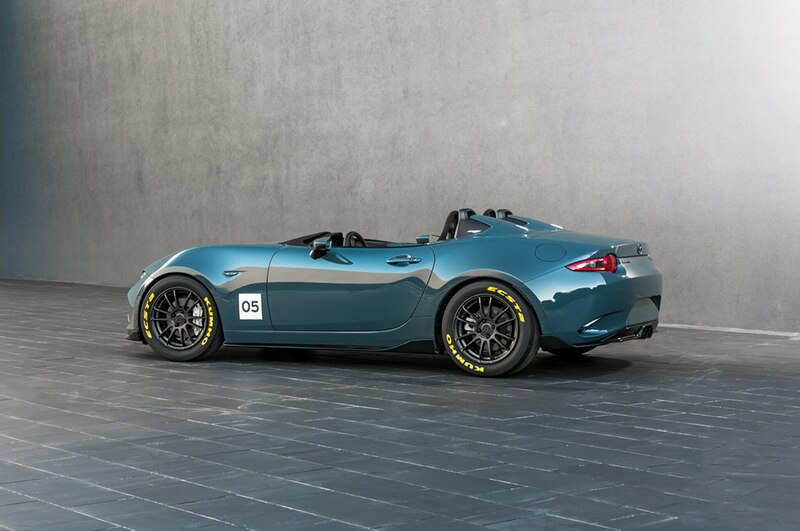 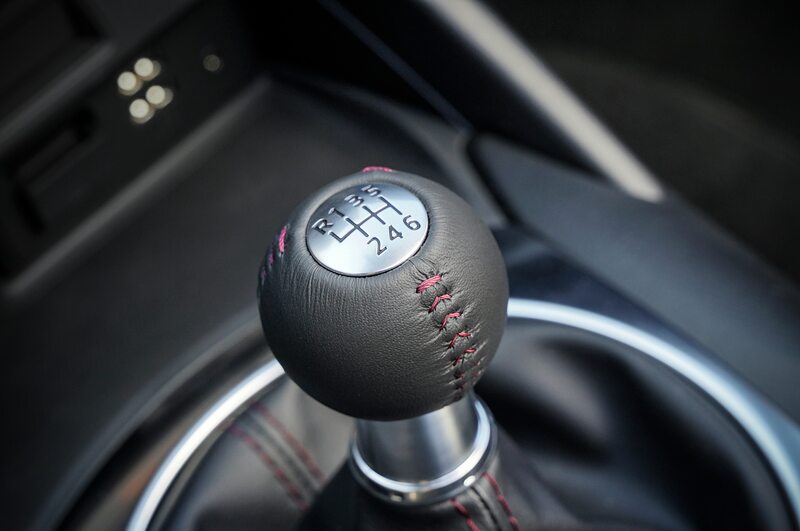 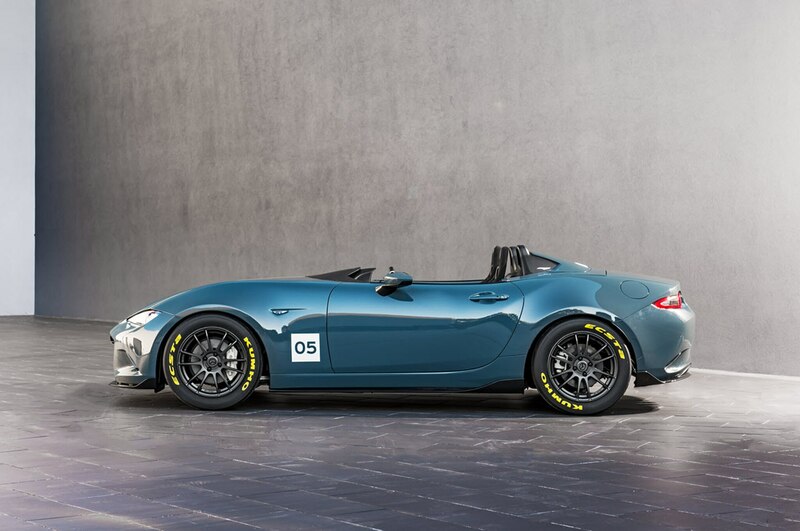 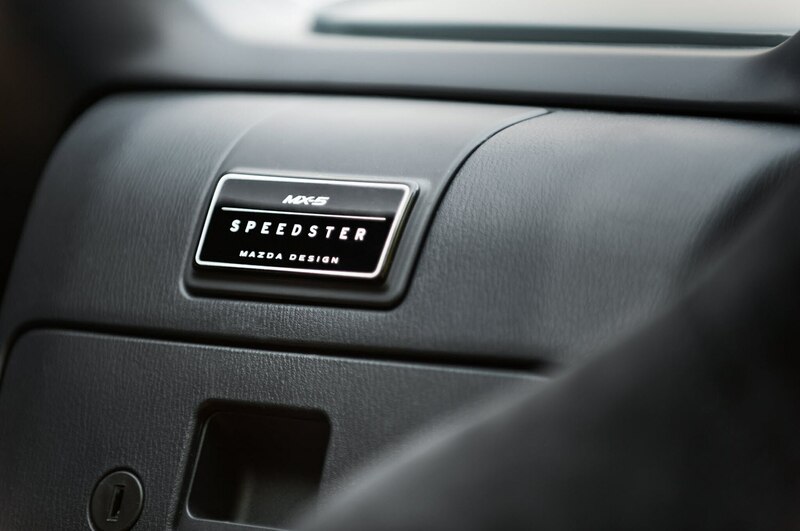 Although these models are not currently slated for showrooms, rest assured that devoted Miata tuners will almost certainly draw inspiration from these concepts in modifying their own roadsters.